A blog about travel, about adventure, about life. Wow, the end is near. At the moment, I am sitting on a rooftop deck in Luxor, Egypt, having spent the last three nights sleeping on a sailboat on the Nile and am leaving Africa after all this time in just eight days. I've been here in Egypt for about two weeks now and while it has been interesting it has been by far the most emotionally draining experience of my entire trip. However, that is all for the next post, first I need to wrap up my time in Ethiopia and as you will see when you scroll down it’s been quite a trip. The north of the country has an incredible mix of wonderful historical sights and natural beauty, and while I only got a small taste of everything the country has to offer it was more than enough to really appreciate the country and recommend it to others. Read on (or just look at the pictures!) and you will see exactly what I’m talking about. Unfortunately the day began with getting scammed. The previous day I’d ‘bought a bus ticket’ towards Lalibela from a stand near the bus station and was told the minibus would pick me up at my place. That didn’t happen, no one showed up, and when I walked to the station to sort it out I was simply lead to a regular local minibus that was of course far cheaper than what I’d actually paid. I honestly wanted to punch the guy in the face, but I didn’t have the time or energy to fight over it. Being on an increasingly tight schedule in these past few weeks has really limited my ability to deal with these kinds of situations where previously I’d had more time and flexibility, which makes it easier to tell someone ‘no,’ look for other options, or fight it out for a fair price. Not being so able to do this was really getting to me and causing me a lot of stress, which I really didn’t need. 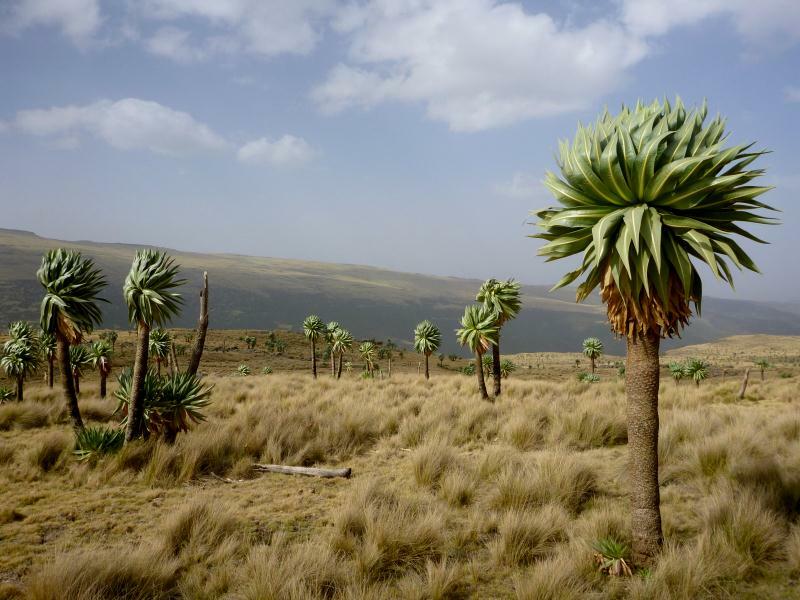 As I wrote about in the previous post, Ethiopia is a great country with a lot to see and do as well as wonderful hospitality, but at the same time there seem to be a lot of people whose mission is to hassle you and cheat you, to a degree I haven’t experienced in other countries. On the whole the balance tilts well in favor towards the positive, but it’s not always easy. 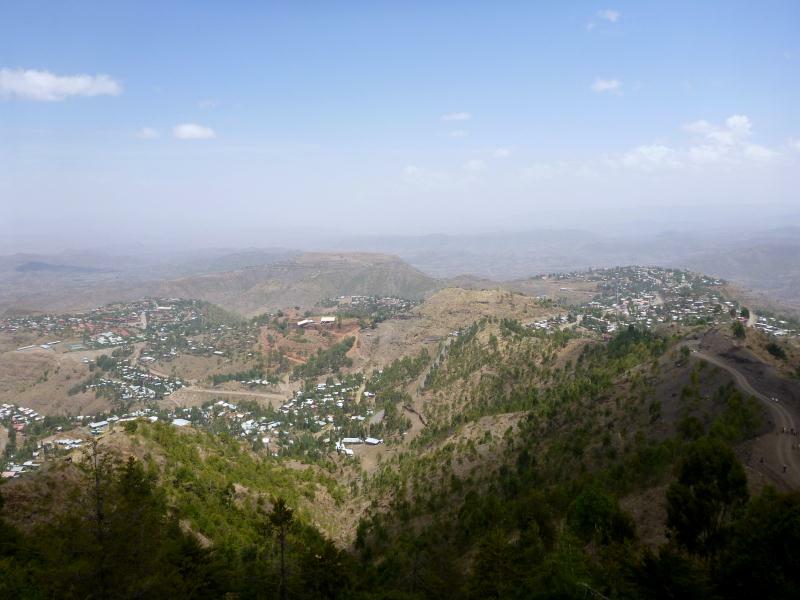 Shortly after 8am the minibus left Bahar Dar, crossed the ‘source of the Nile’ and headed towards increasingly hilly and scenic terrain. Out the window I saw a cycling group (something extremely rare in Africa…), the shell of a tank, rural villages and a great deal of the ever present eucalyptus plantations. 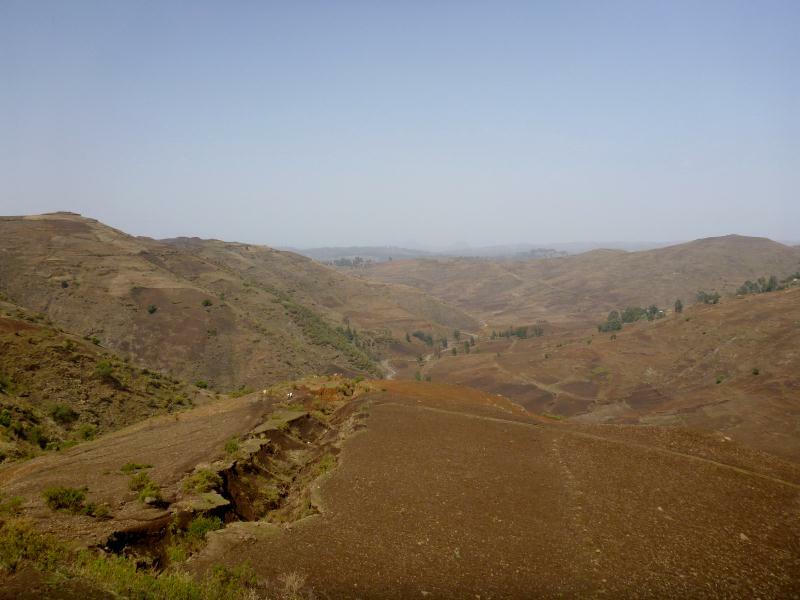 About four hours later I transferred to another bus that would take me the rest of the way to Lalibela, where I got ripped off again by the person selling tickets which only added to my bad mood. At least the scenery was good! As we bumped along the dusty and winding road I looked out the window and had to wonder how anything is able to grow out here. It was the very end of the dry season so the place was hot, dusty and hadn’t seen water in ages, but to me the terraced hillsides seemed to consist of nothing but rocks rather than soil. 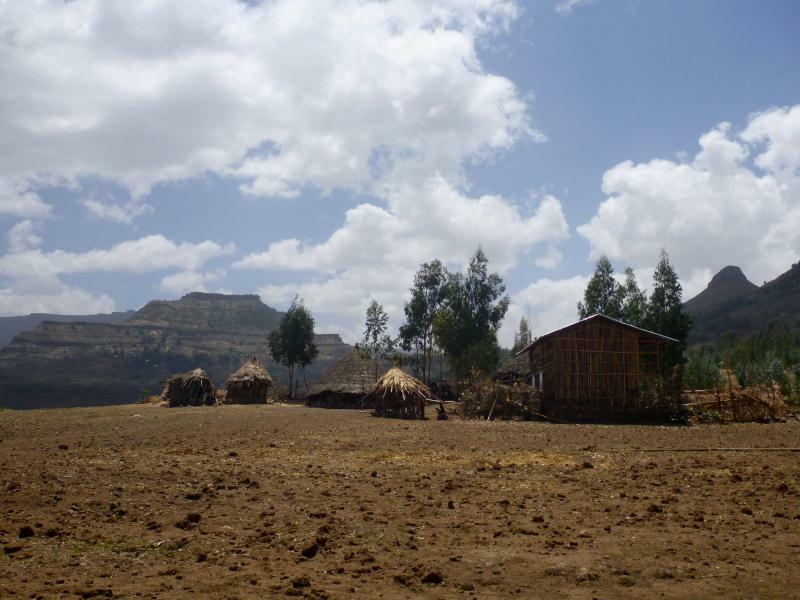 Agricultural productivity in Ethiopia is extremely poor, droughts are a fairly regular occurrence and as a result only 65% of the rural population consumes the WHOs daily minimum food intake and 75% sharing sleeping quarters with livestock. Life here is hard. After two hours on the bus I arrived in the town of Lalibela, found a Slovenian couple I’d crossed paths with back in the Egyptian embassy, sat down to some cheap food with them and found a place to sleep near the bus station (aka a dirt lot) for about $2.50. I had no interest in doing anything else that day, so I laid in bed napping, reading and watching movies on my computer. I awoke the next morning ready to take on the day, knowing it would be a bit of a battle and set off up the hill towards the center of town. As soon as I walked out the gate of the hotel it began, every ten meters someone asking for money, shouting “you you you!” while pointing, wanting to be a guide, or starting in with their same old “what country you from” which in nearly every case is the first question of someone who is pretending to be friendly but only trying to make money off you. To those who seemed friendly, or who were just students who wanted to speak some English I was happy to say hello as I walked, but most people I simply tried to tune out and kept walking. Kids would follow me, saying “hello money!” and I’d say ‘no’, so they then say ‘hello chocolate’, ‘no’, ‘hello pen’, ‘no’, and back to ‘hello money.’ I’ve dealt with this kind of thing before but never on this scale and intensity. 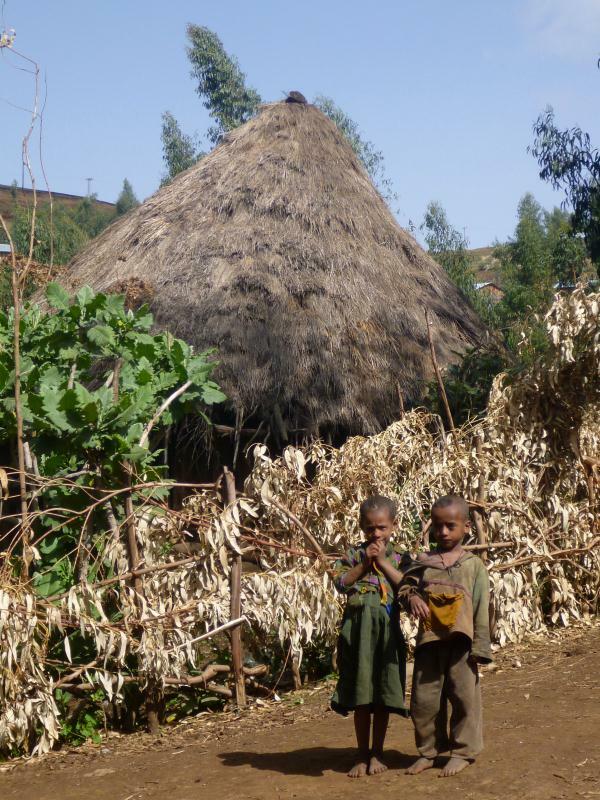 I know they struggle here, but I’ve been in places MUCH poorer, and no one would dare act like they do here in Lalibela. I already hated this town with a passion. I dropped into a local mud brick restaurant where I could escape the people on the streets, had some eggs, bread and coffee, then moved on to another more touristy place for the best fruit juice I’d had in all of Africa. 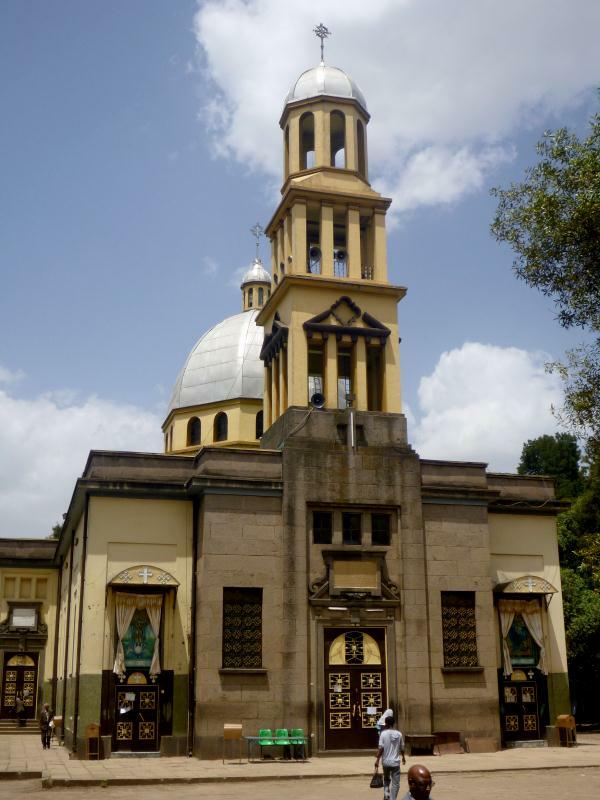 I was here to see the churches, but first I had to figure out how to get back to Addis Ababa. 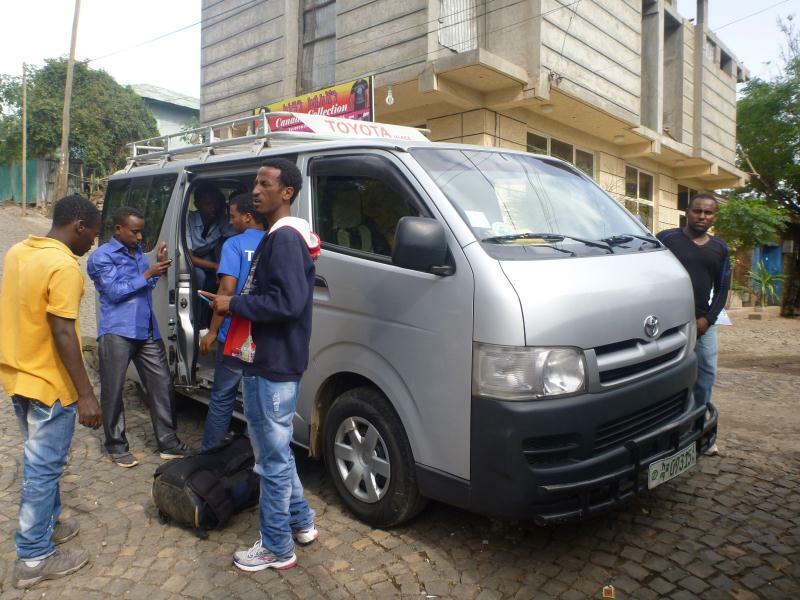 After asking around a bit it seemed that although there are occasional private vehicles that make it to Addis in one day, it’s not a sure thing and the usual method is by bus that ends up taking two days. I opted to fly and luckily got one of the last tickets available. With that sorted out, it was time to try and enjoy what I came here for, the stone churches. 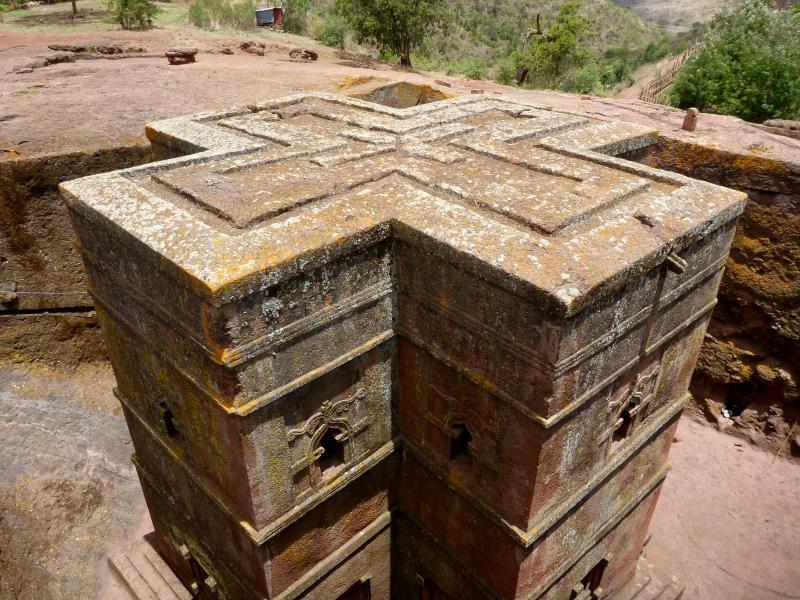 The site is made up of 11 churches, carved directly into the stone during the 12th century during the reign of King Lalibela and remains in use as important religious sites to this day. Some restoration work has been done, including the outside pillars you see in the previous photo, but in general they remain and feel very authentic. I didn’t want to pay for my own guide, but I was able to tag along with a package tour group and gave the guy a few bucks on the side, which worked out well. The insides, floors covered in carpet, lit with cheap florescent lights and filled with a haphazard collection of religious paintings aren’t the most beautiful places, but there are some nice architectural details in some of the churches and they are a cool and quiet escape from the Ethiopian sun. And other than the ‘guards’ asking to see your ticket often, there were no real hassles once inside. 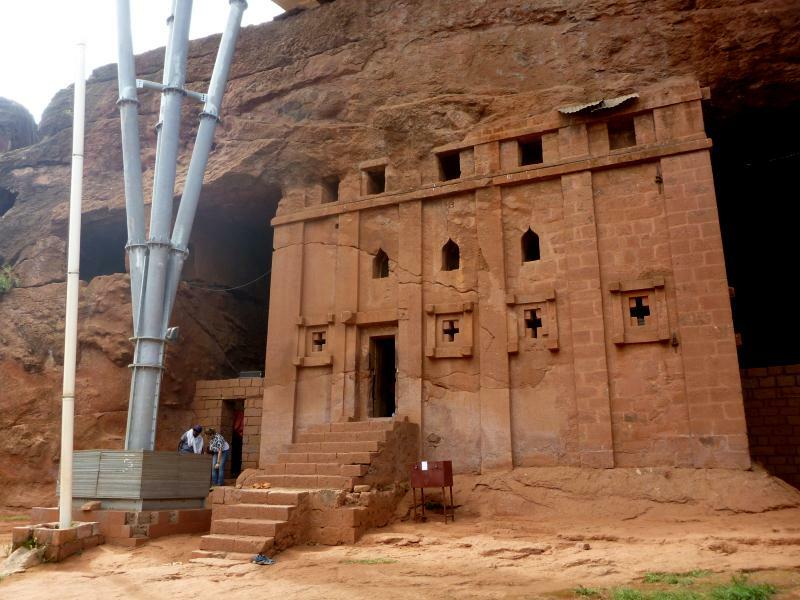 As I said, the place is an active and important religious site to this day and full of authentic Ethiopian Orthodox Christian character. 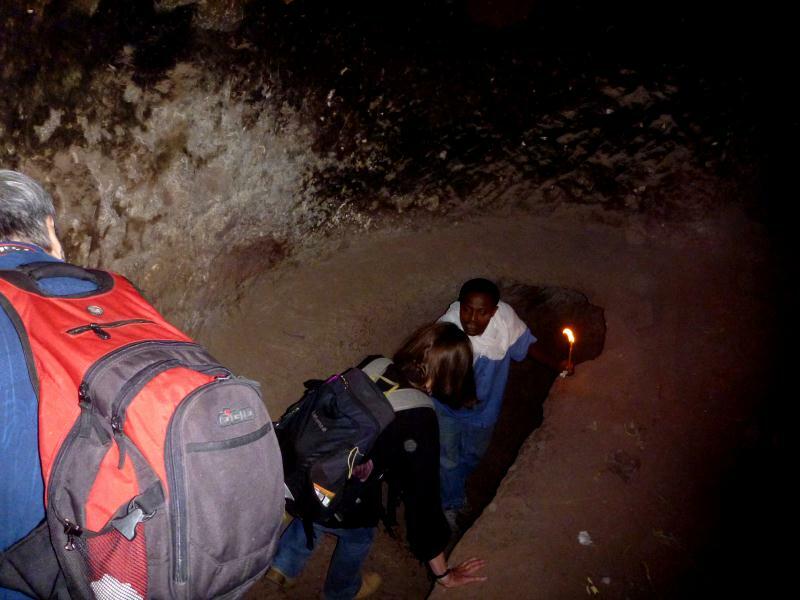 Because the site is made up of numerous different churches, the route to view them all is a bit circuitous, sometimes taking you through dark tunnels deep in the rock itself. Very cool. 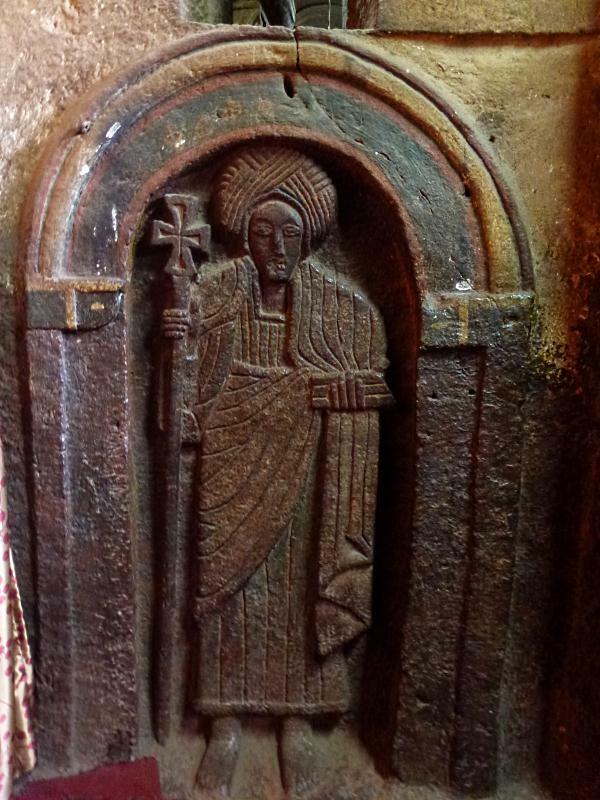 A bit to my surprise, there is very little in the way of carvings of people or icons or scenes; one of the churches had a few carvings of important religious figures but nearly all the work is arches, windows and ledges. The morning section of the tour ended with visiting the most famous of the churches, St George. Carved in the shape of a cross, straight down into the stone and with perfectly vertical and horizontal lines and full of little details it is something very special. 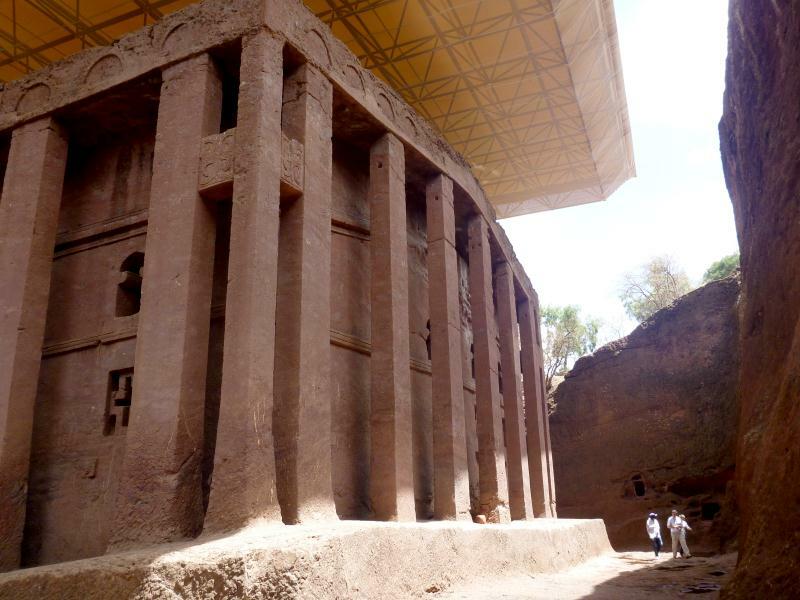 Although not the largest it is by far the most spectacular of the churches and is Ethiopia’s most iconic structure. I returned to the town for the lunch break and was quickly invited into the home of a young boy named Cherent for tea and coffee. 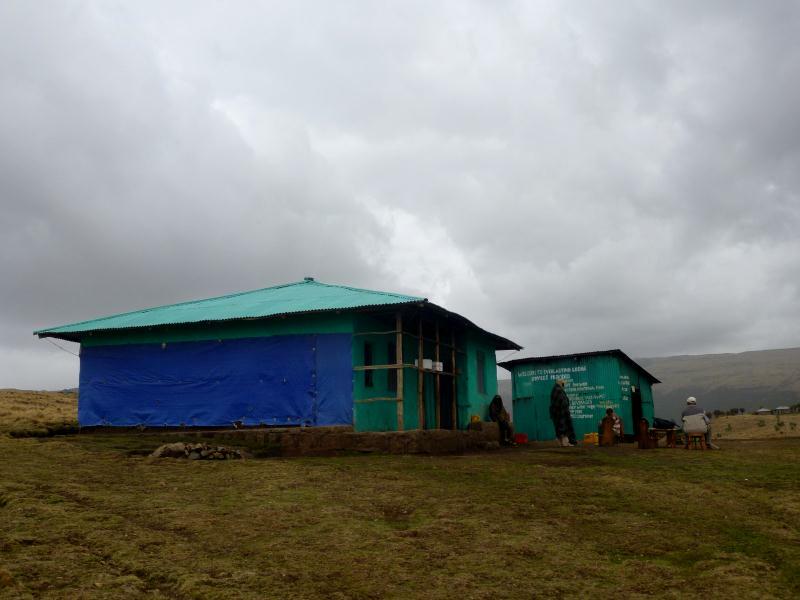 It was a one room mud walled house, with one bed and a few 25kg bags of USAID provided corn/soy blend. He pulled out one of his English language school books, which he said he had to share with 10 other students, and we spent the next hour plus reading sections together, talking and drinking coffee and tea. 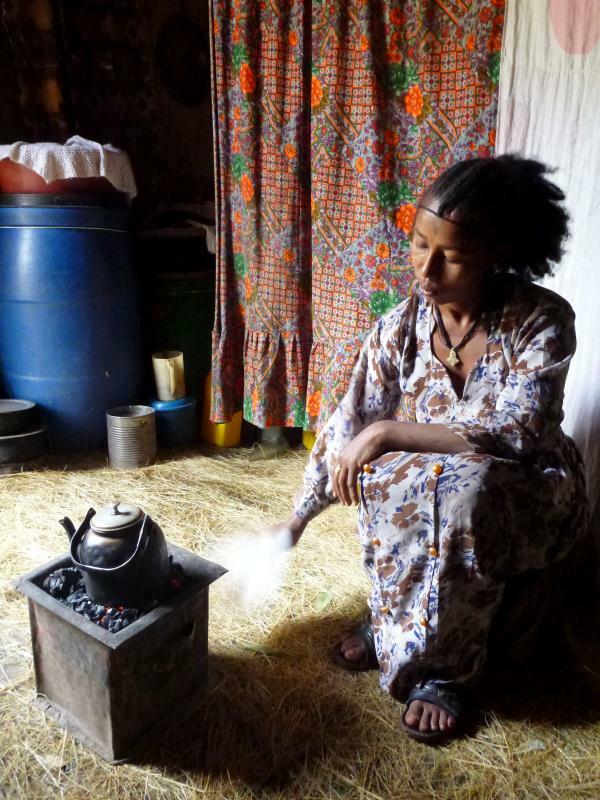 Benchew (Cherent’s mother), wearing with the traditional Ethiopian hairstyle, making coffee. You can’t see it in this photo, but that charcoal stove is actually made of repurposed USAID vitamin fortified vegetable oil cans which I thought was pretty creative. In many places I’ve been (rural Burundi for example) the cans are used as a standard of measurement in the local markets, but here in Ethiopia I think is the first place I’ve seen the material used to build something completely new. Another uniquely Ethiopian thing that doesn’t quite show up in this photo is Benchew’s facial tattoo. It is extremely common to see women here with facial tattoos, which rather scarily I’m told is done with either battery acid or ash. The most common is a cross on the forehead or other religious symbol, and another common one is Amharic text down the jaw from the ear to the chin. Often when I see these out of the corner of my eye, my first thought is it looks like a bearded woman, haha. Still, it’s very cool to see this kind of thing and is simply another illustration of the countries rich and unique culture. In the afternoon I re-joined the tour at another of the churches, one that was first a palace before being transformed into a church. 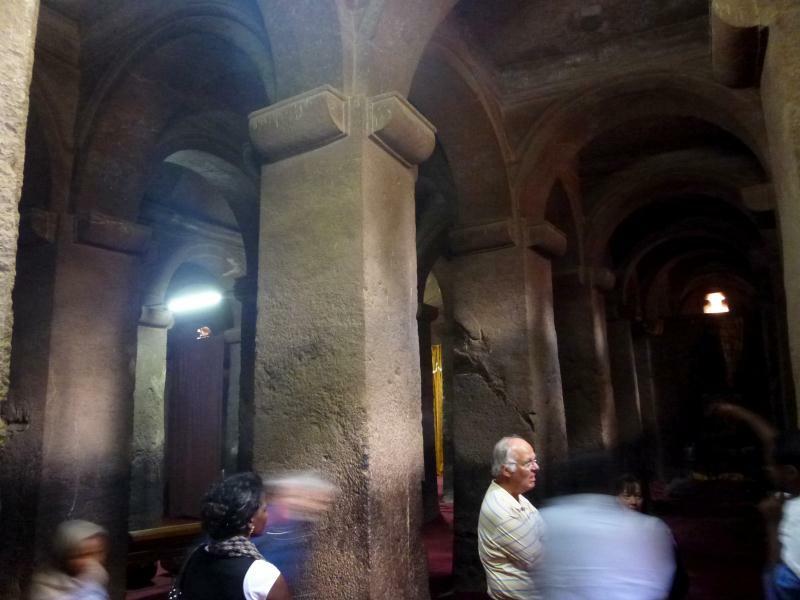 Although it was a fairly small space, it had channels carved that were probably 18 meters deep around it and a bridge to enter, making it a pretty spectacular place. 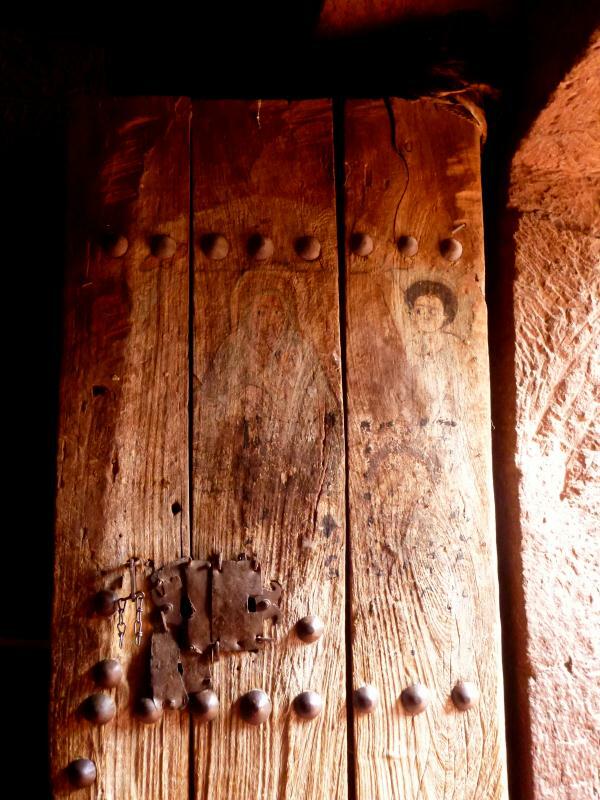 That said, one of my favorite parts was actually the heavy door; a few hundred years old, with a rich red and brown color, rough metal work and fading paintings. After being lead past a series of other stone structures and through a long, totally dark tunnel that is supposed to represent the path to hell, we arrived at another of the largest churches, this with two stories! (Though you can’t go upstairs unfortunately). Shortly after 3pm, the tour was over. I chatted briefly with some of the other members of the group, finding out they were medical architects, here to help advise on hospital design and construction, paid the guide a few bucks on the side and headed back on my own way, having enjoyed seeing the churches quite a bit, pleased I’d had a guide to explain it and ready to go get a cold fruit juice. At the restaurant I met another traveler naturally a German, who told me they were going to be playing football (soccer) with some Spanish guys down at the field and asked if I wanted to join. I said not really, but I’d come hang out. 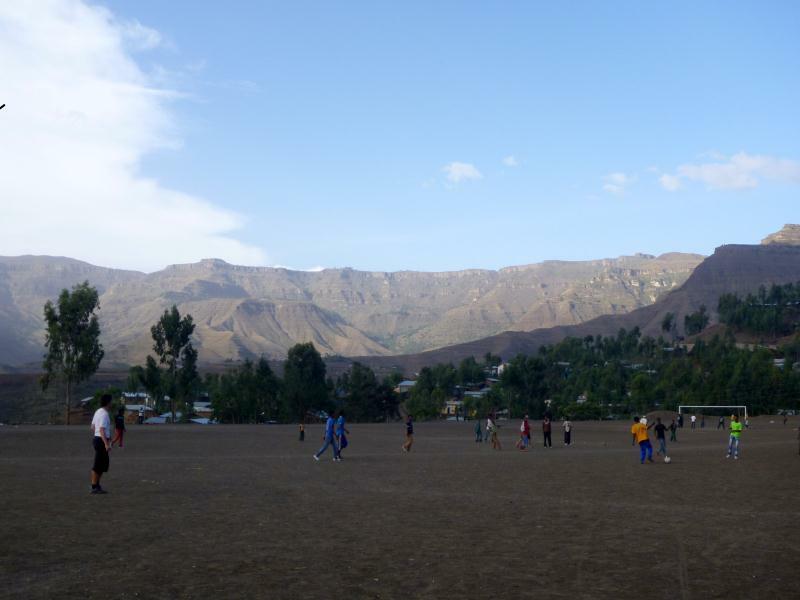 After enjoying another fruit juice, some local food and some coffee, I headed down to the field and watched the children and the European guys play as the sun set on the mountains in the distance. Once the game was over, the sales pitch started, and the kids started up with their well-rehearsed story of how they had a big match coming up and needed money to buy a new ball. Next thing you knew there were probably 20 young boys surrounding them, asking for balls and money and shoes and everything else, using their best manipulation tricks to try and make the foreigners feel guilty and hopefully therefore generous. This went on for probably 20 minutes, including the group of kids following us up the hill a good ways. Only a few boys were doing the talking, the rest were just there for the show, curious how much these white suckers would hand over. 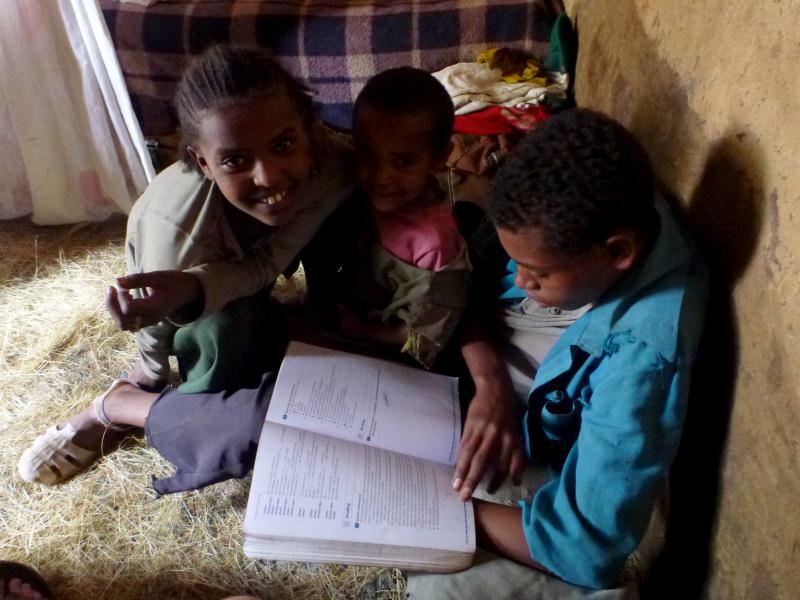 Lalibela, hassle capital of Ethiopia… I briefly gave my thoughts on the matter (you can guess what those were…) and in the end the kids got nothing. During the football match, our little group of travelers was joined by three Spanish women and we all headed out to find some dinner. 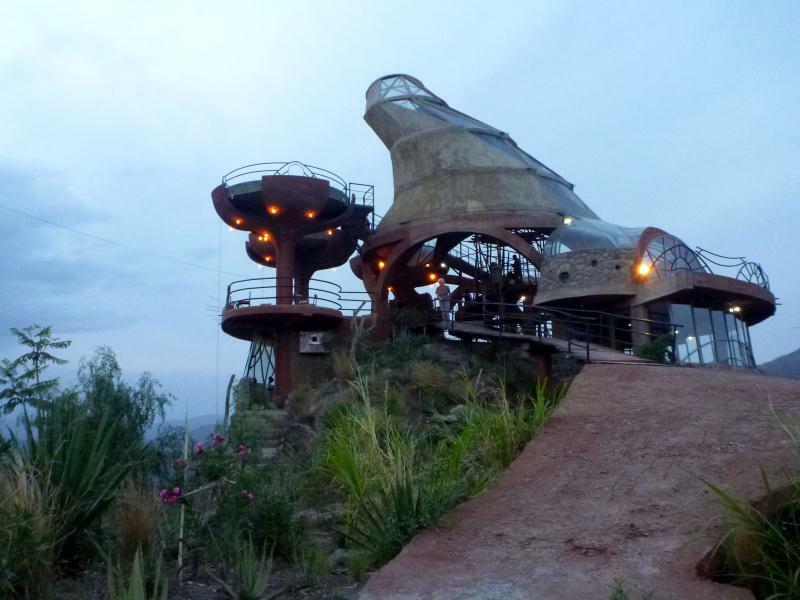 We ended up at a really unique place called Ben Abeba, designed and owned by a Scottish architect. Built on the edge of town and on top of a ridge, it had wonderful views of the surrounding area and is something completely unique in the area and probably the country, hell, I’ve never seen anything like it anywhere in the world actually! It is a crazy mix of spiraling ramps, covered glass areas, open platforms and bizarre angles and shapes. There are gardens, a large outdoor fire pit (where we had dinner and beers) and equally strange toilets. It’s still very much a work in progress, but a very cool place that is without a doubt worth visiting for dinner if you are in the area. After dinner, Markus and I set off to have a few more drinks, ending up at the famous tej place (honey wine) that had some live traditional Ethiopian music, and then moved back towards his hotel. As we were sitting there, we began chatting to a local teenager, who maybe because he was drunk started bragging a bit about how he has three different ‘sponsors,’ white tourists he has met, who send him money for ‘school fees’ and whatever else the story he gives them is. He spoke very good English, so no doubt he is going to school and is a pretty smart guy, but when asked if these three different people know about each other he wouldn't answer. Yes there is a lot of need out here, but keep these kind of stories in mind before you start taking out your wallet…. The area is very scenic, so after a lazy morning more delicious fruit juice and walking through the same streets filled with people hassling me, I set off to hike up to the ‘mountain monastery’ above town. As I headed towards the trail a young boy I’d talked to at football the previous day approached me to be my guide. I was sick of these people and wanted to be alone, so I told him I didn’t need or want a guide. He didn’t leave. I told him again, he didn’t leave, I told him again, he still didn’t leave. Fine. Screw it. I told him I don’t want a guide, but if he won’t leave he can plan guide, but I’m damn well not going to pay him anything for a service I specifically said I didn’t want. Maybe he will learn a lesson. So I started the hike in a bad mood, great. The day was hot, the trail was dusty and the views were great. 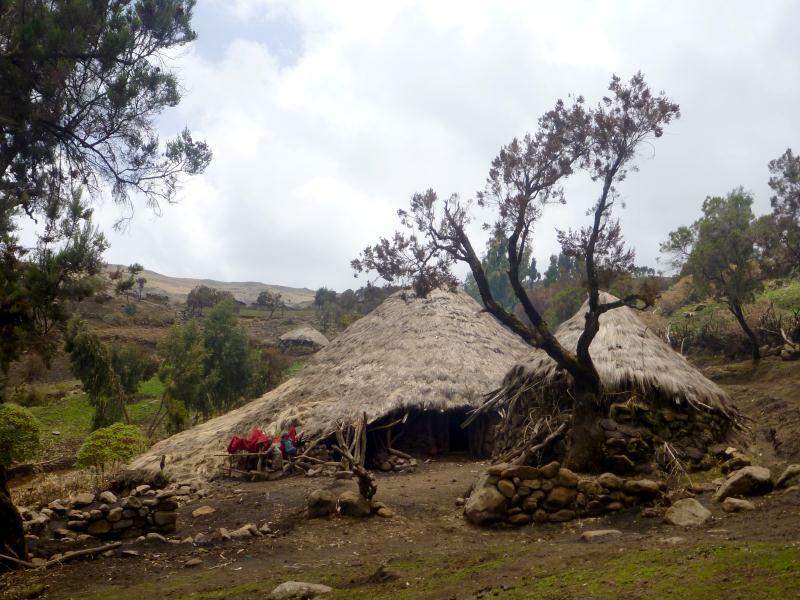 After climbing up a switch backing path filled with students from the surrounding hills going to and from school, donkeys and locals headed to worship, I reached a plateau that had a few simple homes, poor soil and eucalyptus plantations. 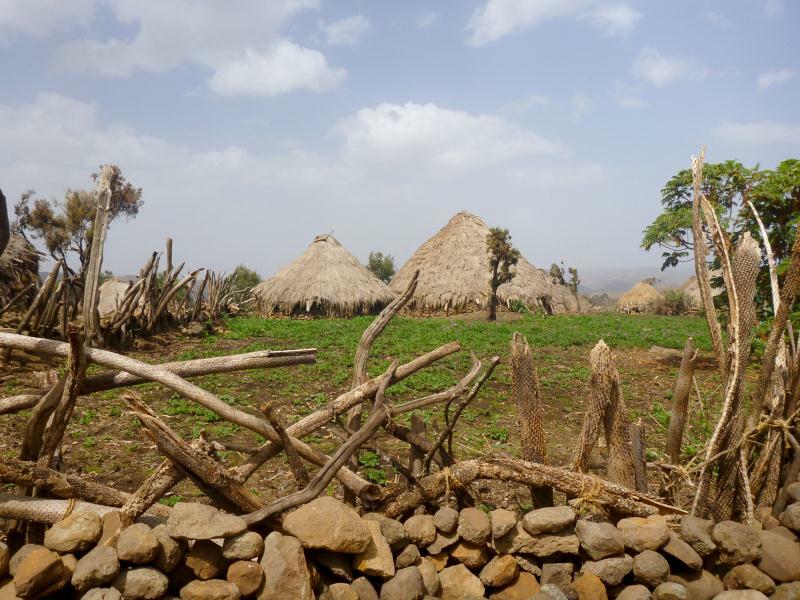 So in other words, the unfortunate norm for rural Ethiopia. 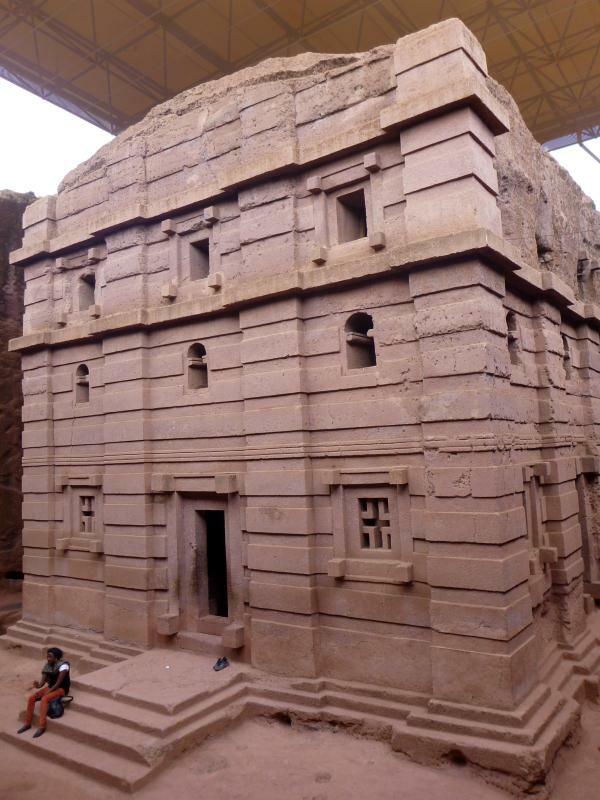 After about an hour and a half of walking, me and my unwanted guide reached the Asheten Mariam Monastery, which is carved into the cliff and overlooks the town of Lalibela. If you look closely, you can see the entrance in the white section of rock near the top in this photo. 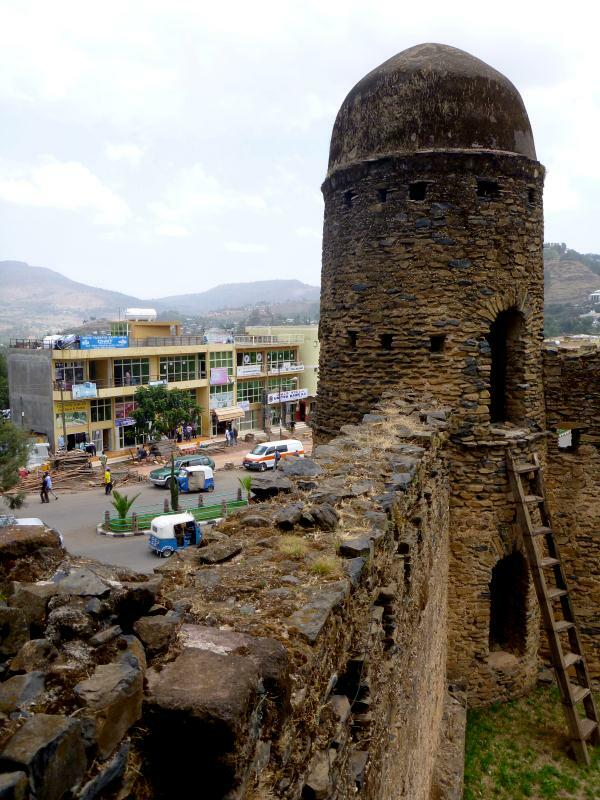 I had no interest in paying an extra 150 birr, almost $10, to see yet another hold in the rock, I just wanted to go for a nice walk and enjoy the views, so I looked around a bit and headed back down the hill into town. My ‘guide’ continued to follow me back to my room, and I simply said goodbye and walked away. Naturally he protested, saying I must pay him, and I had to remind him I told him three times before starting I didn’t want a guide and he wasn’t getting anything form me. He was not pleased and I doubt his behaviour will change, but whatever. I just wanted to go on a nice walk alone, he ruined that for me. 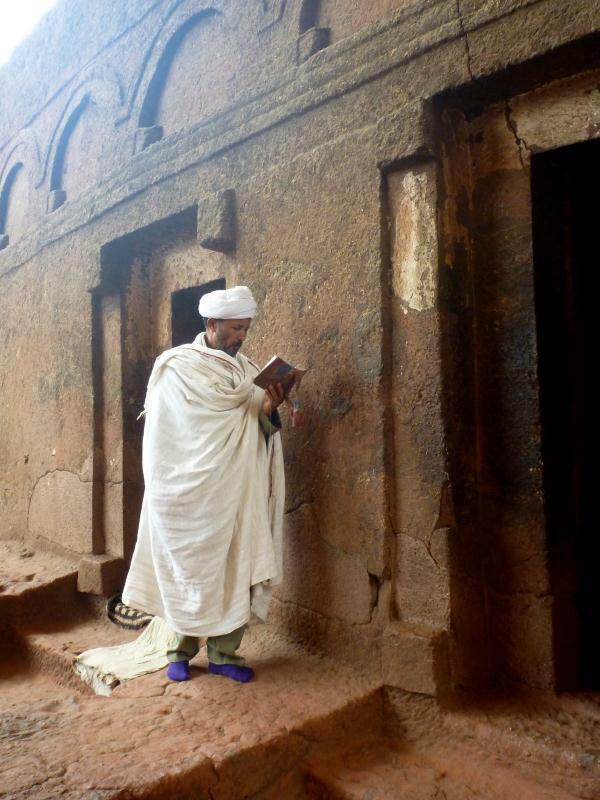 Seeing as I’d paid $50 for the ticket to get into the churches of Lalibela and the ticket was good for 4 days, I returned to the churches to spend some time alone finally and at my own pace instead of with the group like the day before. On this day there were very few tourists, and I had many places to myself which was very nice. I walked slowly, enjoyed the peace and quiet and played around with my camera. 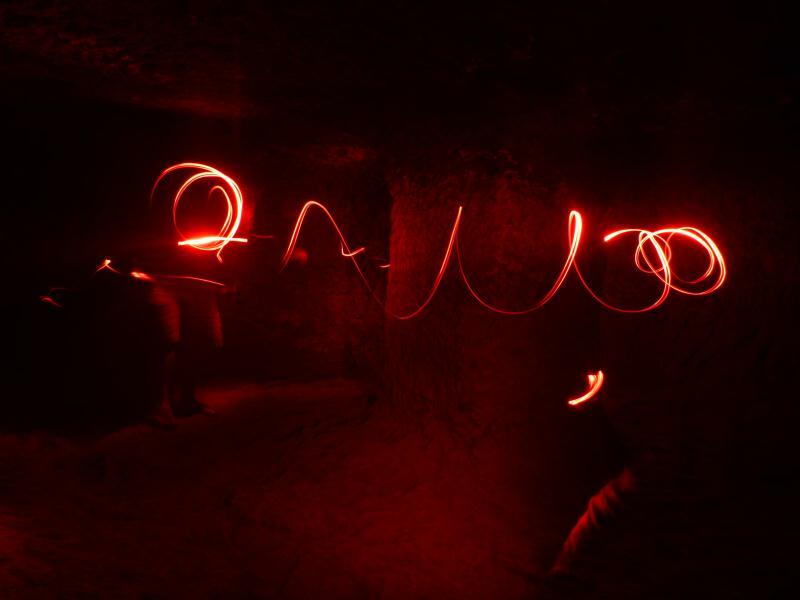 After passing into one of the dark, cool and quiet tunnels connecting two churches, I stopped for a while to enjoy it alone and took out my camera and headlamp for some long exposure fun! Because I had to return to Addis to deal with my Egyptian visa, I caught a shuttle to the airport, which is about 40 minutes out of Lalibela. I was glad to have seen the churches and the area as both were beautiful, but I was glad to be out of the town and couldn’t imagine spending any more time there. Out of everywhere I’ve been, from one end of Africa to the other, I’ve never encountered a place I disliked more in terms of the people. I’m sure most people are kind, polite and good hearted, but those aren’t the people you meet when you walk through town. Instead of meeting the good people, all it seemed I encountered was greedy, aggressive and rude people harassing me constantly that have nothing to do all day but sit around and wait for a white person to walk past. Get me out of here. Shortly after 10am I arrived at the small airport and an hour later was in the air. 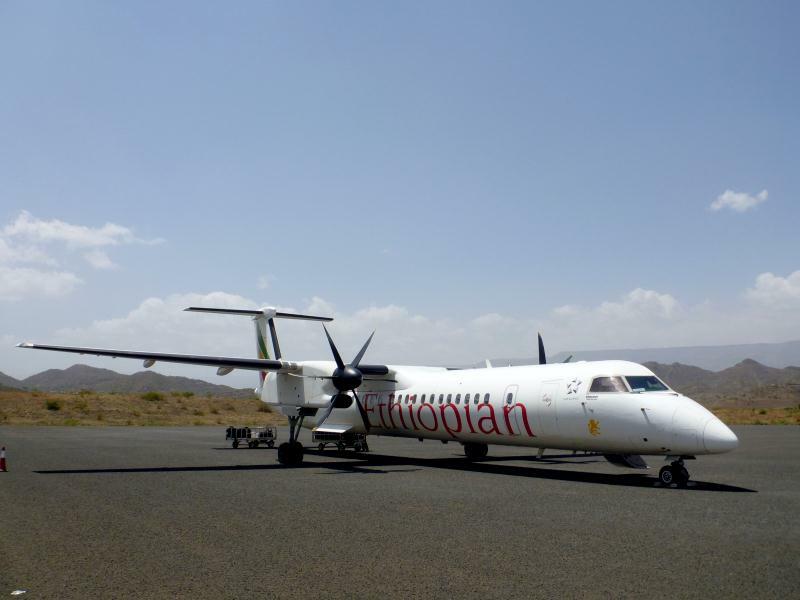 The flight, which cost about $65, flew west to Gondar, then to Addis Ababa. I prefer traveling by land just because it’s more interesting (and cheaper! ), but as I mentioned earlier this saved me a day and a half of travel time, I was running on a schedule, and I found it to be a pretty convenient and reasonable way to get about the country. Having arrived in town a day before my appointment with the Egyptian embassy, I figured I’d drop by anyways and see what the status was. The news? Bad. After having waited nearly two weeks for them to simply put a sticker in my passport, I was told that my passport wasn’t scanning on their machine and I needed to take it to the US embassy and get some sort of letter certifying my passport was real! This was obviously ridiculous, but what could I do? Luckily the US embassy is nearby, so I trudged that way and discussed the matter with them. The US embassy told me that of course it’s a real passport, that what the Egyptian embassy was saying was absurd and that no such letter ‘certifying’ my passport exists. Great. I walked back to the Egyptian embassy, told them all of this and was told…. To come back tomorrow. I had a bad feeling about this. Luckily Addis my previous CouchSurf host, was awesome, and I’d kept his apartment key while out on my journey and therefore had a hassle free place to return to. After the crap I’d dealt with over the past few days I was in a terrible mood and this passport problem certainly wasn’t happening. If I can’t get the Egyptian visa, I can’t get the Sudan visa, will miss the country entirely and will ‘fail’ my trip traveling through every country from one of Africa to the other. And I really want to see Sudan. I spend the whole next day dealing with this visa problem again, visiting the US embassy and again being told there is nothing they can do, the problem is obviously on the Egyptian end. When I went to the Egyptian embassy, I was told that a higher up was coming and I could talk to him, and I spent the next three hours waiting. He never showed. For the third day in a row, I returned to the Egyptian embassy and this time had reinforcements, Joey and Travis, two other American guys who were doing the exact same thing and having the exact same stupid problems. At least with three of us it was clear it wasn’t a case of a bad passport, but a problem with their system in dealing with American passports. We spent the next few hours waiting again for a guy who never showed up and complaining about how absurd and frustrating the situation was. Eventually the woman behind the desk inexplicably told us that they could probably sort it out, took back our passports and told us to return on Monday. More waiting. The longer this takes, and it’s running into its third week at this point, the less time there is to deal with the notoriously insane Sudan embassy and the less likely that is to actually go through. Not looking good. 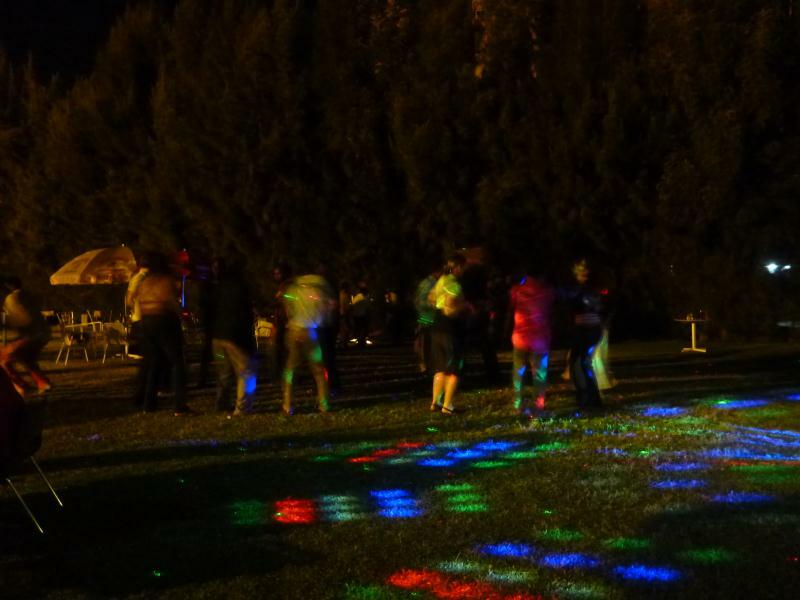 That evening was a party at the place where Addis works, so we took minibuses out there to see what was going on. The place is pretty strange, a sort of oasis of western world in Ethiopia (although I'm told it has 80% Ethiopian staff). It is an entire office complex designed for NGOs, built like a business park in America, had a totally different look and feel from the rest of, well, Africa, and was full of people doing aid work, research and development. This night was the end of a conference which is why there was a party, but it wasn’t all that interesting and was really just a strange scene of plenty of middle aged white people pretending they weren’t in Africa. The next day Addis, Katia and I headed out to check out Mercato Market, said to be ‘the largest open air market in Africa.’ Personally I didn’t see what all the fuss was about. 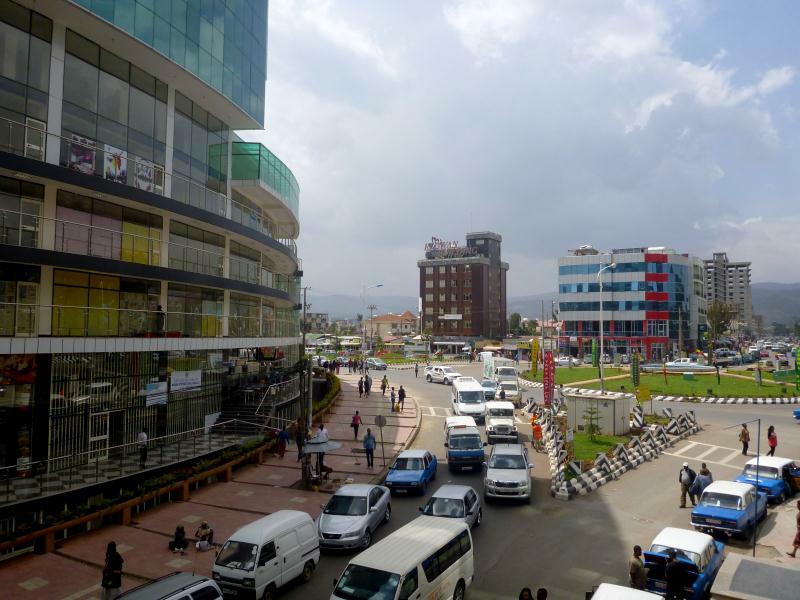 If I hadn’t been told about what it was supposed to be ahead of time, I wouldn't have though it was anything different from any other part of town filled with shops, nor really any different from other markets in Ethiopia and across Africa. That said, African markets are fun places to wander around and full of interesting sights, sounds and smells, so I certainly didn’t mind walking around for a while. With Addis as our guide, we walked through the ‘metals section’ and something really incredible happened. 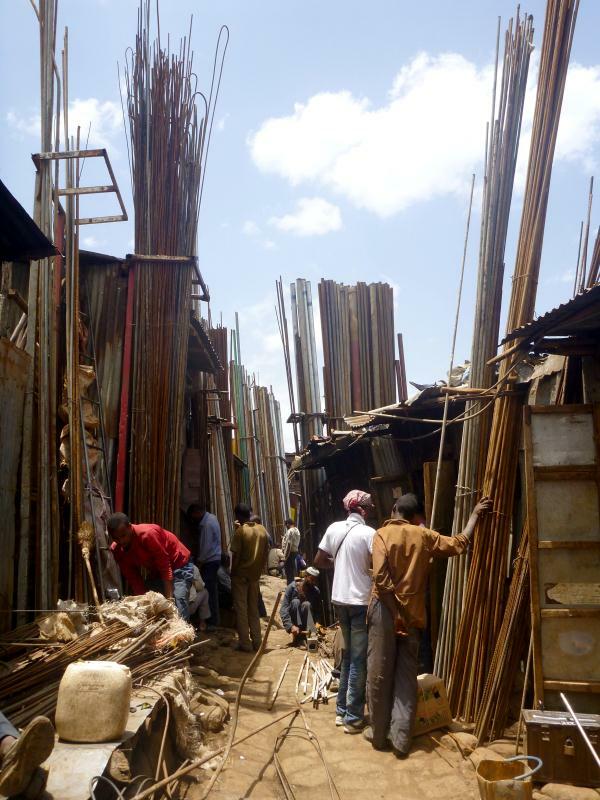 As we walked the narrow alleys, people were doing all sorts of metal work; straightening bent pieces of wire, cutting angle iron into different lengths, pounding corrugated metal into flat sheets and so on. Maybe it was only in my head, but the complex, diverse and competing sounds of men working metal on metal seemed to turn into a kind of music, with its own unique rhythm and melody, completely surrounding me. It was a brief moment and two or three turns later we were out of the area but there was something very beautiful and powerful about it. Africa man, love it. Eventually we left he market, checked out a nearby church, got some fruit juice and headed home for dinner. 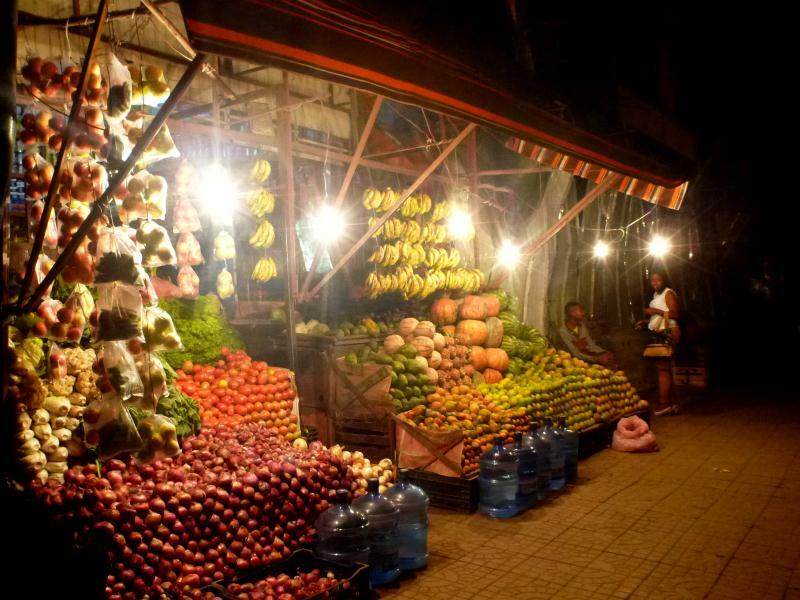 One of the countless fruit stands that line the streets here in Addis Ababa. Hungry yet? That night after getting together with a bunch of people for pizza, we spent the next hour or so trying to find a hotel where there was supposed to be some sort of reggae party. Naturally it turned out the taxi driver didn’t actually know where it was and this lead to much frustration, but by 11pm we finally found the place and it was a big let-down. Instead of a live band like was implied, it was just a guy with dreadlocks playing records. At least the view over the city was nice! Maybe it was the pizza that did it, but I woke up the next morning sick, making it only the third time on the whole trip. After spending most of the morning in pain and with horrible things coming out both ends of me I started feeling better by the end of the day and even got some food down. It wasn’t too bad and I was 100% the next day, but it’s never how you want to spend your time. Monday afternoon the other Americans and I returned to the Egypt embassy, and were extremely pleased to finally receive our visas. 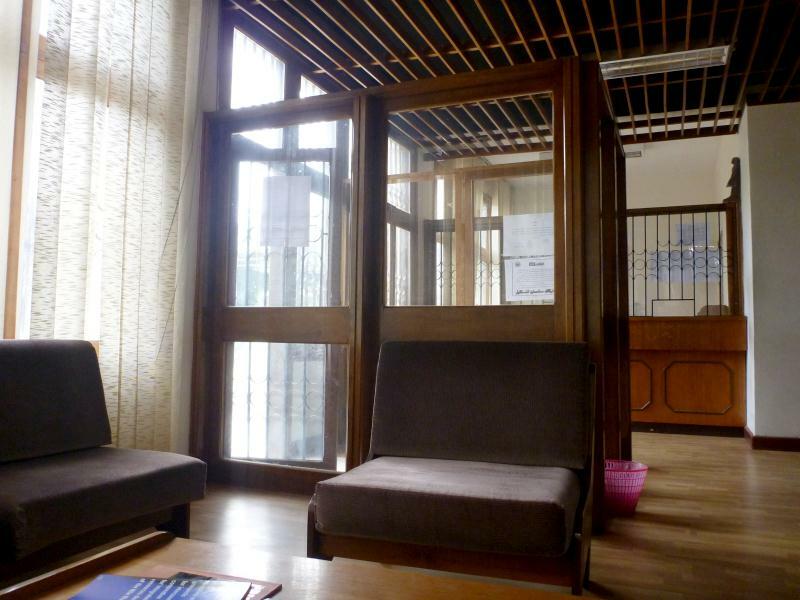 I think the process took me something like 10 visits to the embassy and three weeks, but we finally had our visas. We quickly headed to the Sudan embassy because having the Egypt visa was supposedly the last thing we all needed to apply for Sudan, and were told… to come back tomorrow. At 8am we all met up at the Sudan embassy to attempt to apply for the visa, prepared to fork over a whopping $200 for the 15-day transit visa. The guy wasn’t in. We were told to wait. Air Bud was playing on the TV mounted to the wall, and everyone sitting in the office waiting stared at it like zombies. Eventually the window opened, we went up to apply and were basically told it wasn’t possible to get into Sudan. Perfect. Not yet giving up, we ended up speaking with another more friendly man, but now they were telling us something new, that even for the transit visa, we would need letters of invitation from someone in Sudan! This would have to be sent to the ‘foreign office’ in Khartoum, and they the office in Khartoum would have to send it on to the embassy here in Addis, and then we could start the process of applying. Sudan, every horrible thing you have heard about the visa process is true…. Joey and Travis had been working with a hotel owner in Sudan who helps organize the paperwork for travelers and gave him a call. 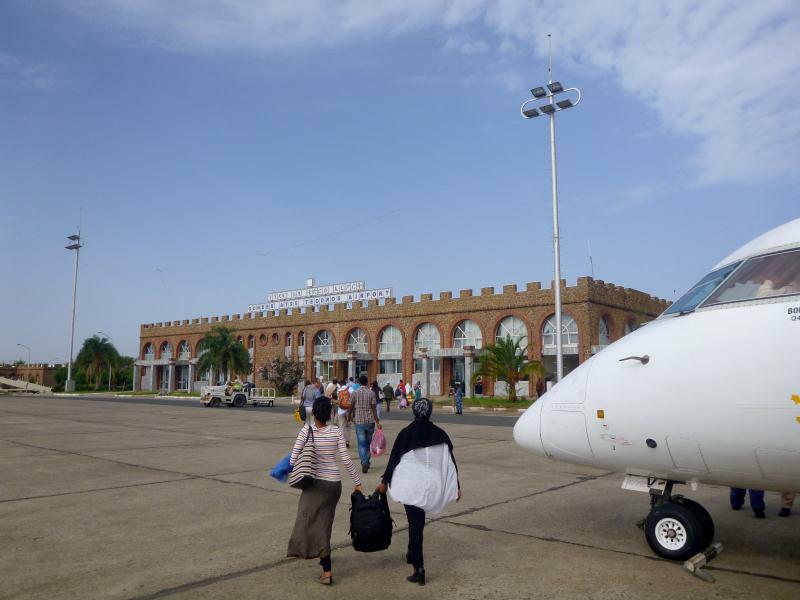 What he said was that this process will take at least a week or two, involve visiting a handful of government offices in Khartoum and cost another hundred or two hundred dollars. Fine. I give up. 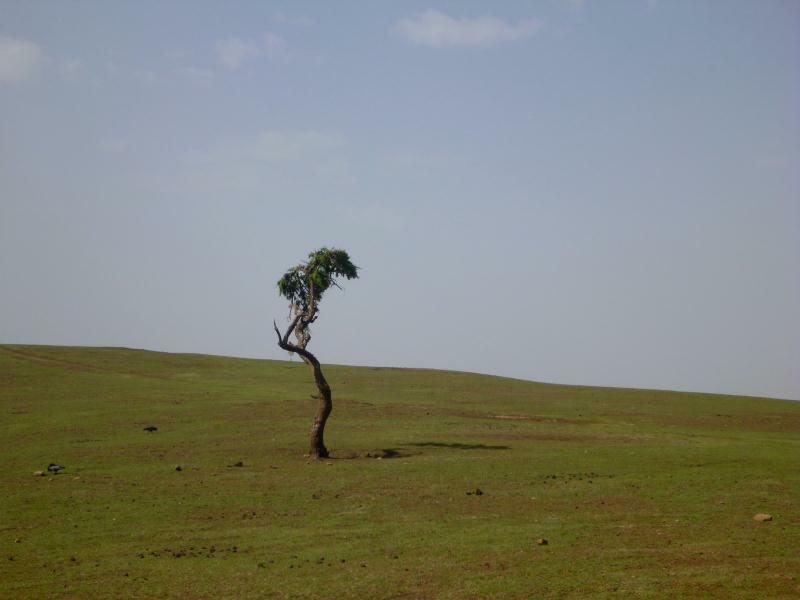 Sudan, I wanted to visit, I really did. Everyone says the government is horrible but the people are wonderful, I wanted to come see this fascinating country for myself. But you are almost impossible. All I was going to do was pass through, spend a bunch of money for the ‘privilege’ and take a few photos. That’s it. It’s clear you don’t want foreigners in your country but you are only hurting yourself and your people…… If I had more time, I would have tried to wade through your nonsense and see your country, I really wanted to visit, but what can I do? The whole thing really disappointed me. Not only was I missing out on what I thought was going to be one of the most interesting countries in all of Africa, but I was having to fly over the whole damn thing putting a huge break, geographically historically and culturally in my attempted journey from one end of Africa to the other. We all went out to an extremely disappointing brunch, complained and mumbled to ourselves and tried to figure out what to do next. The worse part really was how much time and energy I wasted on the Egypt and Sudan visas. I was in Ethiopia for 36 days and I feel like I lost at least 10 of those days dealing with the visa, in addition to having to bounce across the country just to keep the appointments. 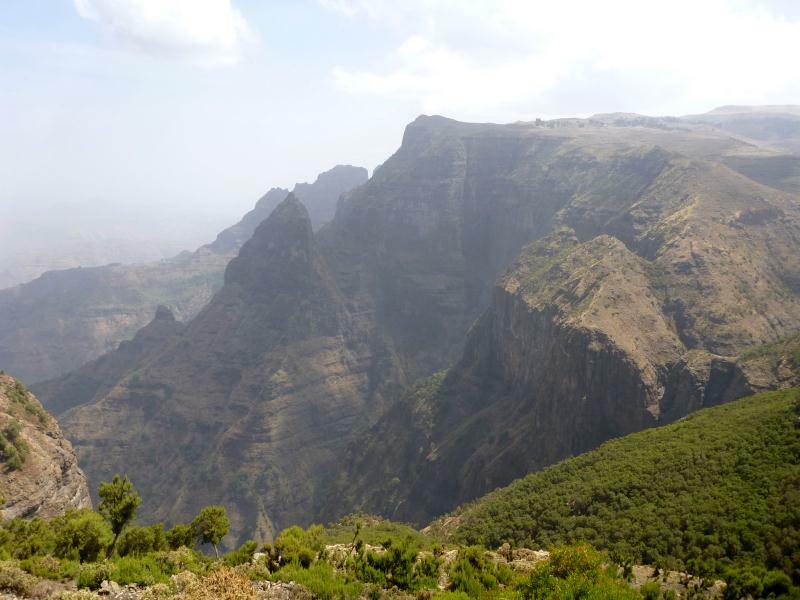 I could have seen SO much more of Ethiopia if it wasn’t for this whole thing wasting my time in the beginning, middle and end of my time in the country… Just take a deep breath and move on, it was out of my control…. We hung out for the rest of the day and into the night; getting lunch, swapping movies and drinking beers back at Taitu Hotel. With Sudan out of the question I at least now knew my schedule and made a plan. This gave me an extra week in Ethiopia and an extra week in Egypt I would have otherwise been spending in Sudan, so I bought my plane ticket from Addis Ababa to Cairo, which cost me $370, and another ticket from Addis Ababa to Gondar in the north of Ethiopia for another $65 to save time. 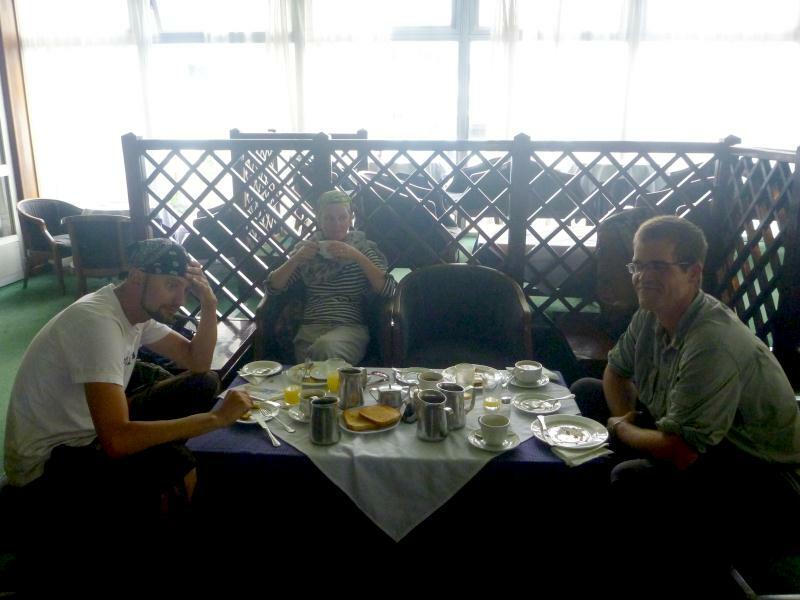 I had to wake up at 5am to go to the airport, but by 8:45am I’d landed at the Gondar airport. My plan was to see the castles for the day then move north to organize and go on a hiking trip in the Semien Mountains. 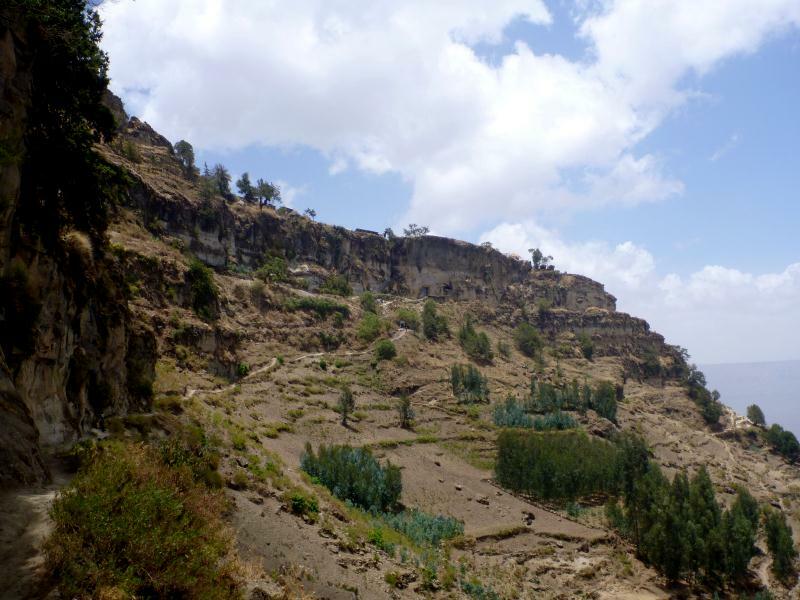 If there was time, I was hoping to somehow then make it to Harar before returning to Addis Ababa where I’d fly to Egypt. It was a lot to fit in, and I was feeling the time crunch, something I hate, but I wanted to get a few last things in here in Ethiopia before I had to move on. I’d do my best. 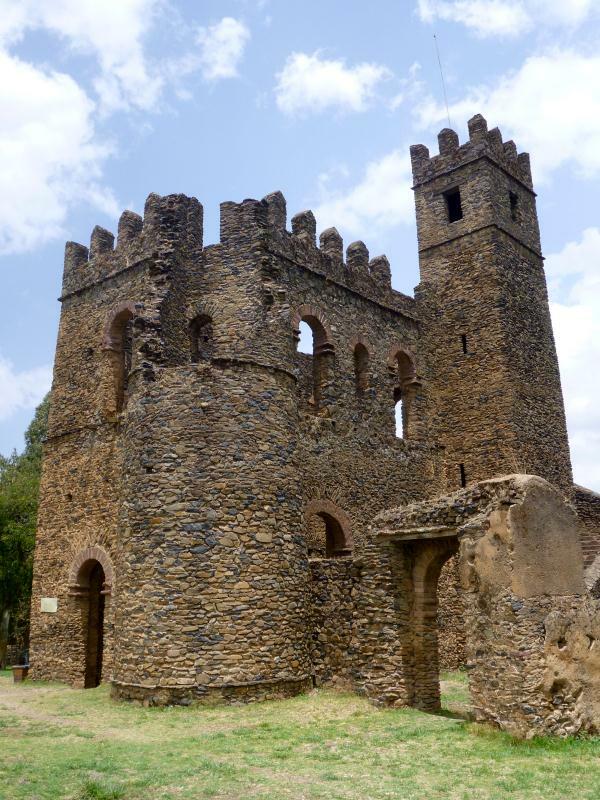 Other than the wonderful old castles, there isn’t much to say about Gondar, but the castles and the nearness to the Semiens make it absolutely worth the visit. All of the castles are contained in a walled compound which the modern town has grown around and makes a cool contrast between the two different worlds. The entrance ticket was a very reasonable 100 birr, and after turning down one or two perspective guides, I wasn’t hassled at all and had the place nearly to myself which was very, very nice. 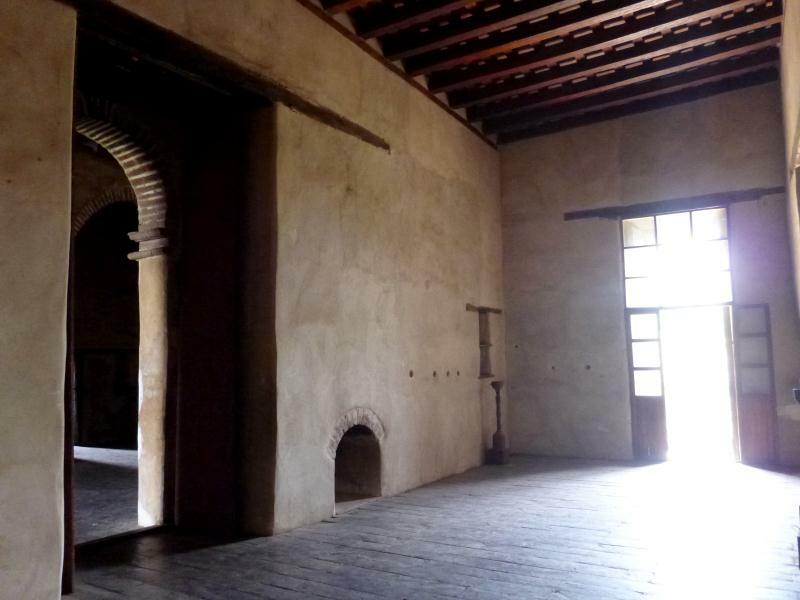 High ceilings, huge doorways, wood floors and many fireplaces. Looking over the walls into the modern town. The area contains dozens of structures, from imposing castles, to library’s, to lion cages. I spent a relaxing hour walking through and enjoying the area. A little more time would have been nice and there is an old church in a different part of the town that is also included with the ticket, but I had a bus to catch and had to go. 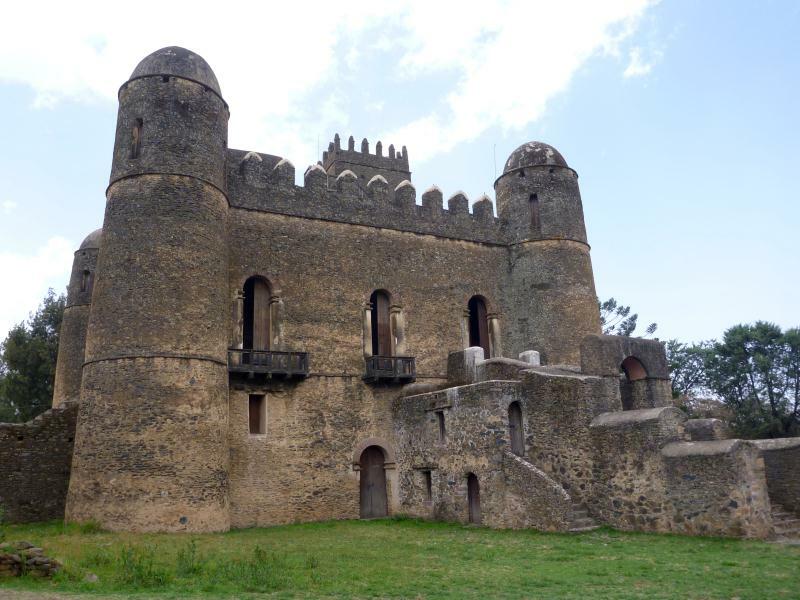 I left Gondar for the town of Debark, paying way too much for what should have only been a 30 birr, 3 hour minibus ride, but I got there and was at least happy it had gone smoothly. 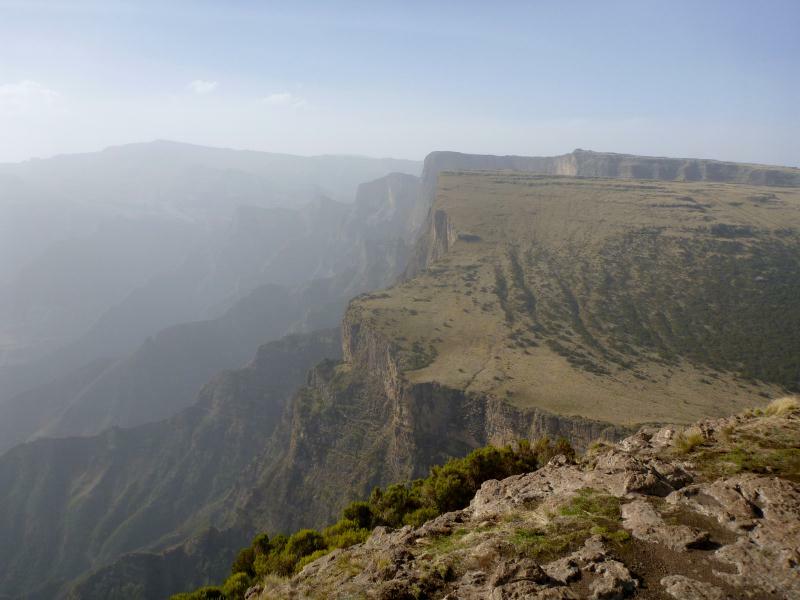 Debark is where the Semien Mountain National Park office is located, and while you can organize hikes from other parts of the country through travel agencies, it is quick, easy and much cheaper to just do it in person when you show up at the office. The people at the office were very helpful explaining my options for hiking, and laid out the prices as follows: 90 birr a day for the park entrance fee, 75 a day for the required ‘scout’ who is a guide but just leads the way and doesn’t speak English, 80 birr a night to stay in the lodges along the way (you can camp for 30 or something), 60 a day to rent cooking gear and 130 a day for a mule and mule driver to carry everything. You can also hire an English speaking guide and a cook if you would like. All that is required is the park fee and scout, so if you come with your own camping gear the trip is amazingly cheap. I’d been stupid and didn’t bring my cook stove so I had to rent that, but I decided to be lazy and enjoy myself a bit, opting for the mule to carry my things and to stay in the lodges instead of bringing my tent. Even with this, plus paying for stove fuel and another $15 for my food, the 4 day, 3 night trip cost only about $115 in total. In a short time, everything was organized to leave the next morning. Easy. 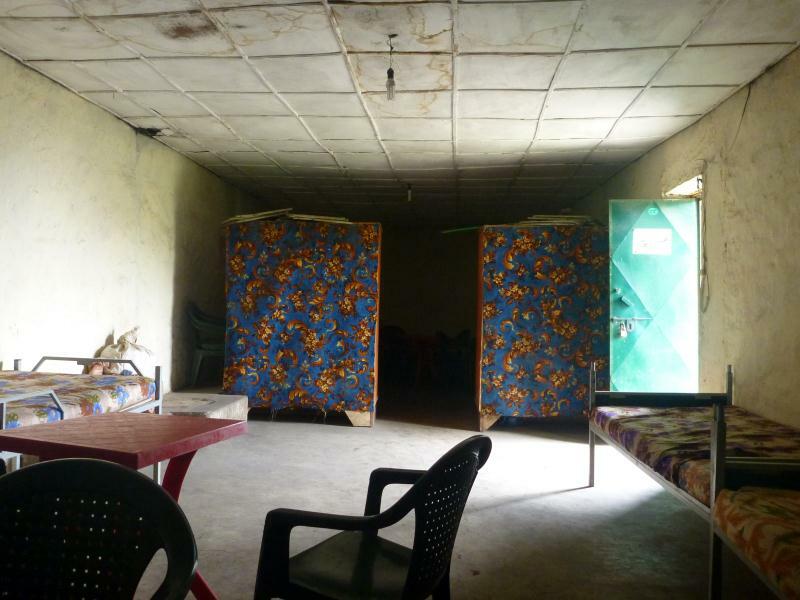 I found a mud walled hotel with no running water and used condoms behind the bed for a few dollars, then set out to do my food shopping. 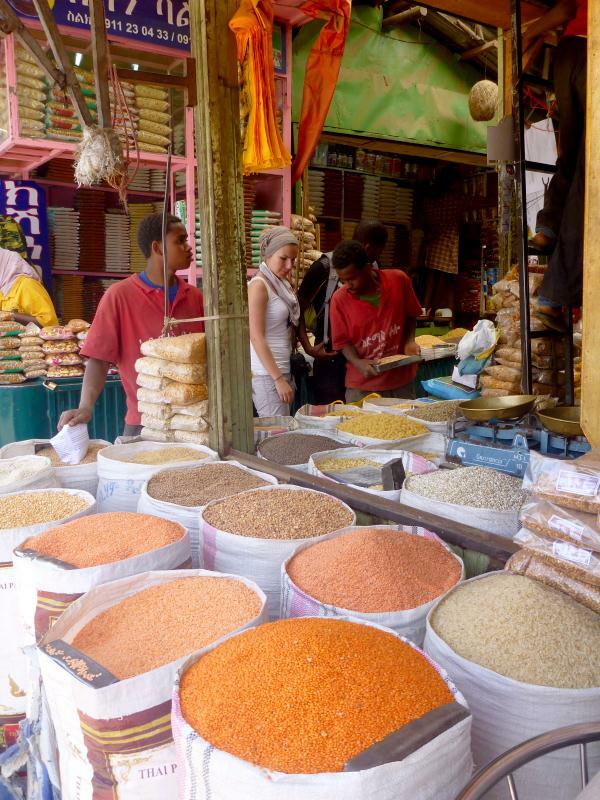 There is almost nothing in the town of Debark, only one store to buy food other than the local market, and options were basically rice or noodles and a few canned goods. If you want better food, pick it up in Gondar before coming, but you can make do and I wound up with some noodles, tuna fish, veggies, bread, peanuts, jam, oatmeal and cookies. It wasn’t fancy but it would do. I had a few beers that night and tried to get online, but the power kept going out and it wasn’t really possible, so I laid on top of the bed in my hiking clothes and went to sleep. By 8am the next morning my scout and I set off, walking out of town and towards the countryside. Once out of town, we spent the next few hours walking through empty fields that were being prepared for the start of the rainy season. It’s certainly not the dramatic cliffs and troops of baboons people come to the Semiens to see, but I actually enjoyed just walking through a rural agricultural area, having spent so much time in similar areas all across Africa. My scout leading the way. I have no idea what the gun is for, just for show really. This is seriously an incredibly safe and relaxed area. Though he didn’t speak any English, he was great guy and guide, pointing out animals in the distance, helping carry my things and making sure he stood between me and aggressive dogs in the villages. One thing to keep in mind about this trip is it isn’t a wilderness hike like you might think. You walk through farmers’ fields, along roads, between herds of cattle, sheep and goats, under power lines and through villages. It wasn’t what I was expecting, but I actually enjoyed that aspect of it a great deal. 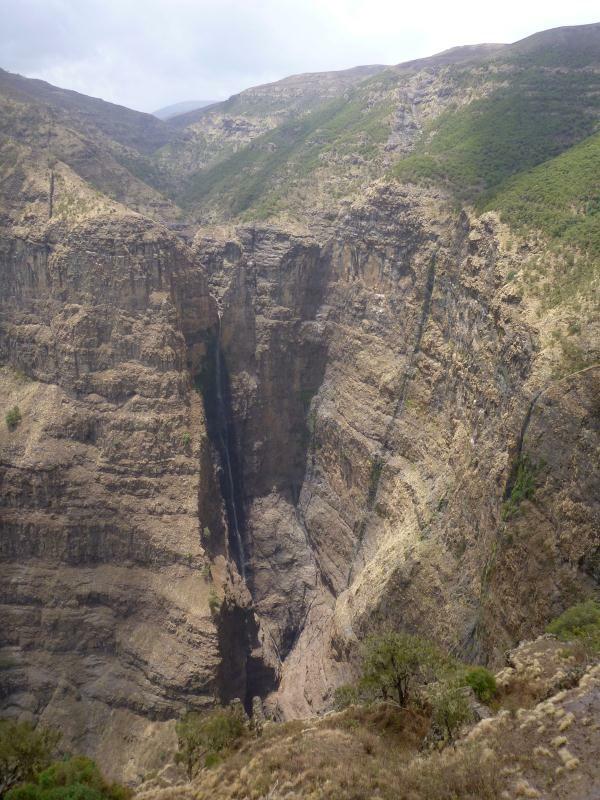 After about three hours of walking the scenery became everything I had expected; huge cliffs, low brush and hundreds of baboons. 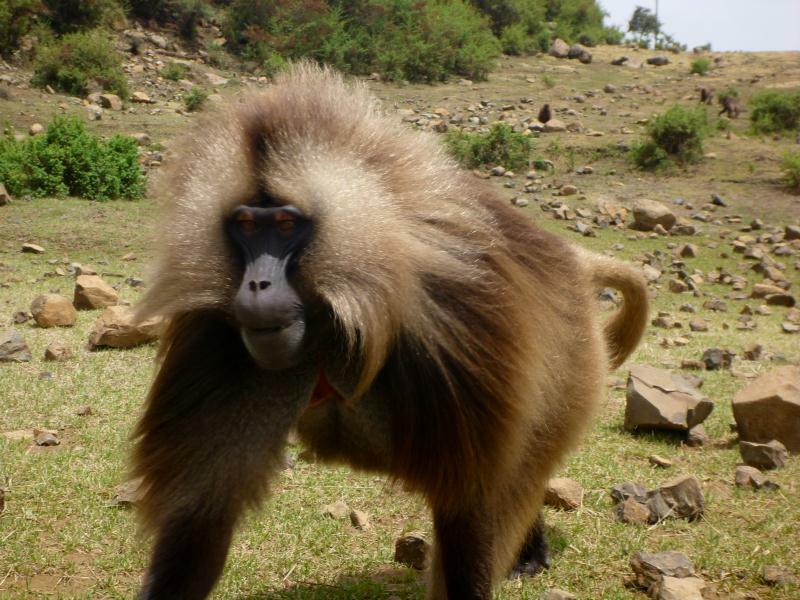 The first gelada baboons I was were a troop of at least 100 in the distance but I was hoping to get much closer. After stopping for lunch on the edge of a massive cliff and checking out some of the small flowers starting to poke out of the soil with the rains that just started, I saw another huge group and headed straight for it. Baboons are normally quite aggressive creatures and it would be a bad idea to do this with other species, but geledas are incredibly relaxed. As I got closer, they pretty much ignored me completely and went about their business, walking, running and scooting around on their butts as the pulled grass to eat. 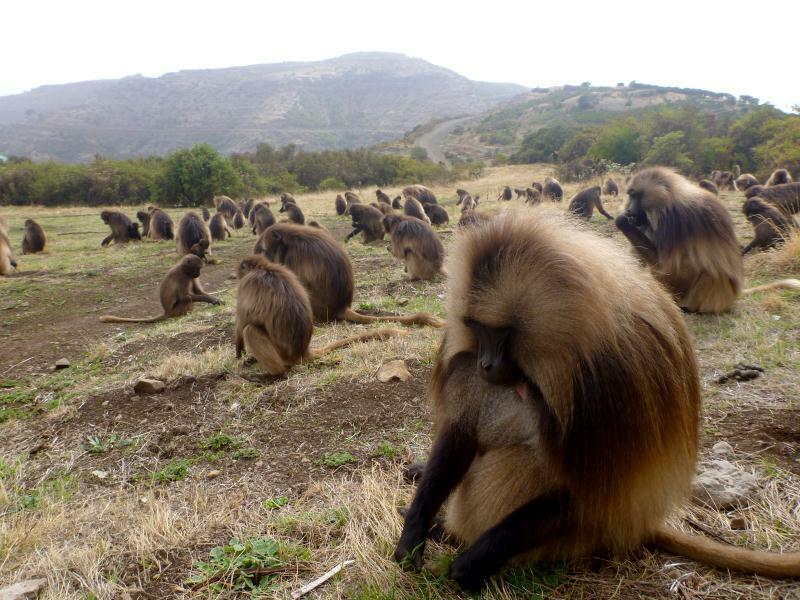 Camera in hand, I sat down to watch and was really amazed by the fact I was sitting in the middle of 100+ baboons, with the only sound being the wind, the occasional screech of young ones play fighting and the sound of them tearing out bits of grass all around me. I’ve had a LOT of animal encounters out here in Africa, but this is without a doubt one of the most unique and wonderful. We kept walking, the scenery kept improving. Shortly after 2pm, six hours after leaving town, my scout and I arrived in the ‘town’ of Sankabar, a few buildings along the road, where the lodge and campsite are based. 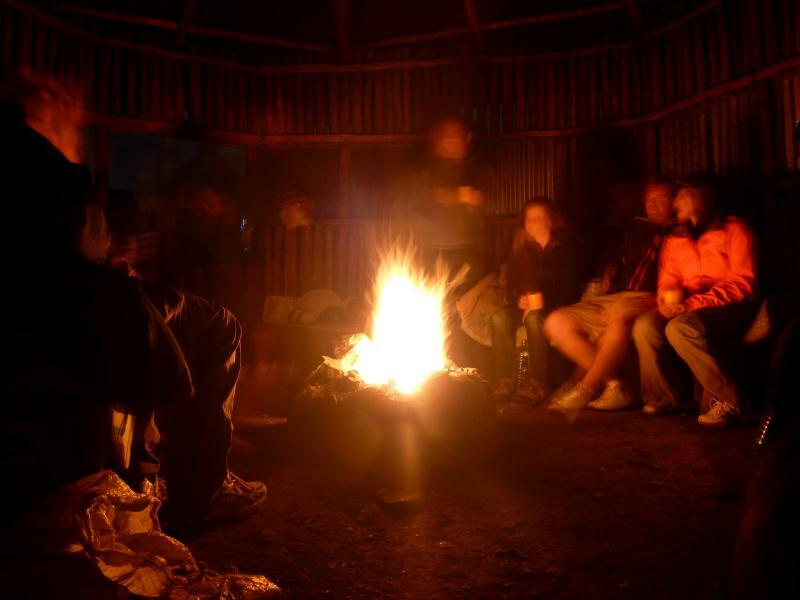 I’d intended to stay in the lodge, but then a guy came up and offered me a very cheap tent rental and said there were other people around the camp site, whereas I was alone in the lodge. Happy to save a few dollars and have some people to hang out with I walked to the campsite where I was greeted yet again by a large troop of baboons, just passing through grazing on the grass. I think there are nearly 50 in this photo alone, and that was just a portion of them! That evening I met two other Americans who were also hiking out here and spent the afternoon and evening chatting and eating with them in the cooking hut. Over the evening a number of other groups showed up, some walking, some by car, and we all sat around the fire sipping a great bottle of 12 year scotch a Scottish guy brought with him. After waking up early to watch the sunrise and cook a totally uninspiring breakfast of oatmeal with peanuts and jam in it (like I said, food options were extremely limited! 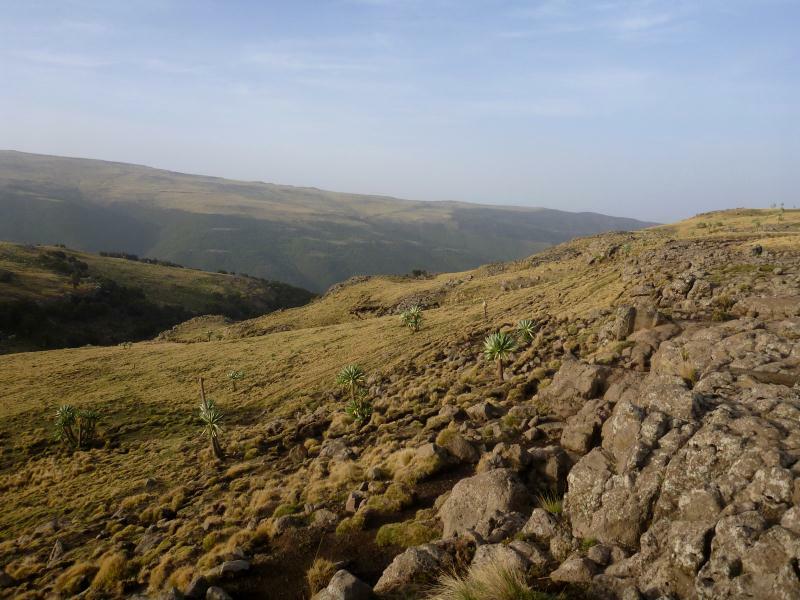 ), we set off on the trail which runs along the cliff edge, checking some interesting birds, strange plants and plenty more baboons. After an hour and a half, we reached a viewpoint with not only fantastic views of the cliffs and villages below, but of one of the most spectacular waterfalls I’ve ever seen, Jinbar Waterfall. Again this is the very tail end of the dry season so water levels are very low, but even so it was fantastic. I can only imagine it when the water is really flowing. There were a few different raptor species flying around the area, taking advantage of the winds and updrafts to lazily cruise along the cliff edge looking for prey and I spent an hour watching them and the water fall on the other side of the valley before heading off again. As we walked farther and farther up, it became time to take a lunch break so I climbed over the stream and across the rocks to sit by this small waterfall to eat my bread and bananas. This is actually just upstream from the long falls in the earlier photo, that little stream is all that is making the huge drop right now. 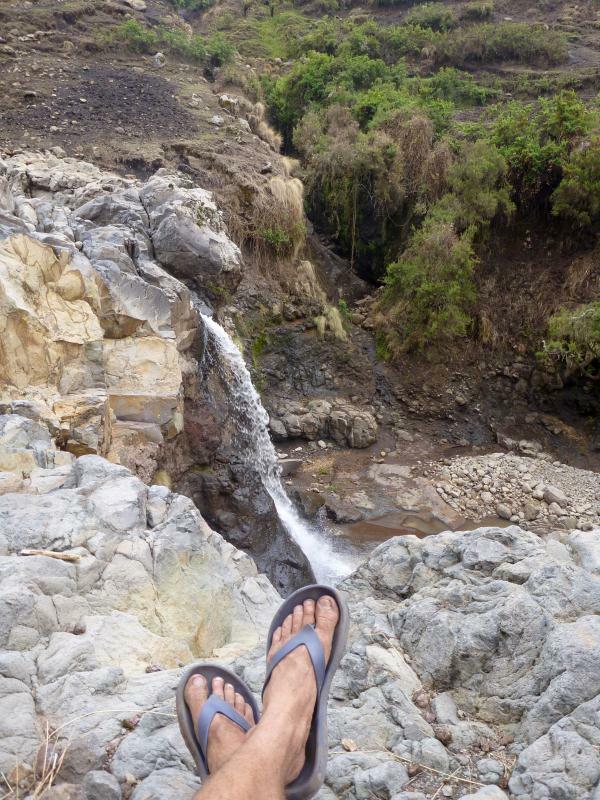 Oh yah, and of course I did the whole hike in my $2 Ugandan flip flops, which everyone thought was crazy. A bit later on we passed through this small farming village I believe is called Gich. The layout, construction methods and architecture, in particular the huge low-angle grass roofs, were a style I’ve never seen before and found very interesting. Just beyond the village is ‘Everlasting Lodge’, the place to sleep for the second night and including the stops at the waterfall and lunch which totaled probably an hour and a half, it took five and a half hours of gradual to moderate uphill walking to reach this site. After putting my bag down in one of the three dorm style sleeping rooms, I headed out to enjoy the scenery, perching on a boulder on the hill above the lodge. 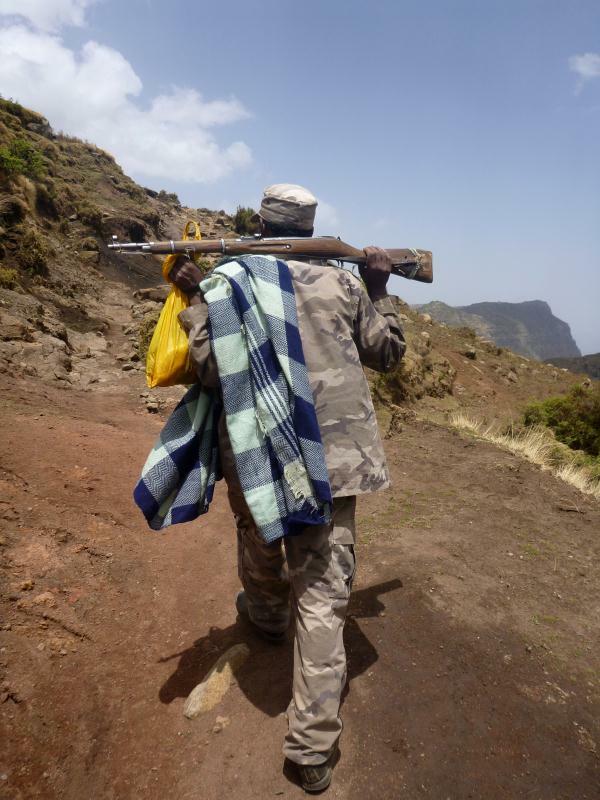 My guide, taking his job seriously, followed me, wrapping himself in his blanket to hide from the cold and waiting about 60 meters away. As I sat watching light change across the grasslands the air was filled with the sounds of cracking whips sounding a great deal like gunfire, from the young boys herding the various animals around the area and like the metal workers in the market it created a strange but beautiful soundtrack. Two French women were also staying in the lodge and I spent the night talking to them, also opting to buy dinner on this night rather than cook for myself. As the sun was going down, someone ran inside to tell us to come out and look. In the distance was the rare Ethiopian wolf and although it was only a quick glance, it was cool to see. The next day was going to be a longer one, so I woke well before sunrise to pack my things, eat breakfast (eggs, which I also bought from the lodge) and get ready. By 6:45am we were on the trail again and walking towards the rising sun. 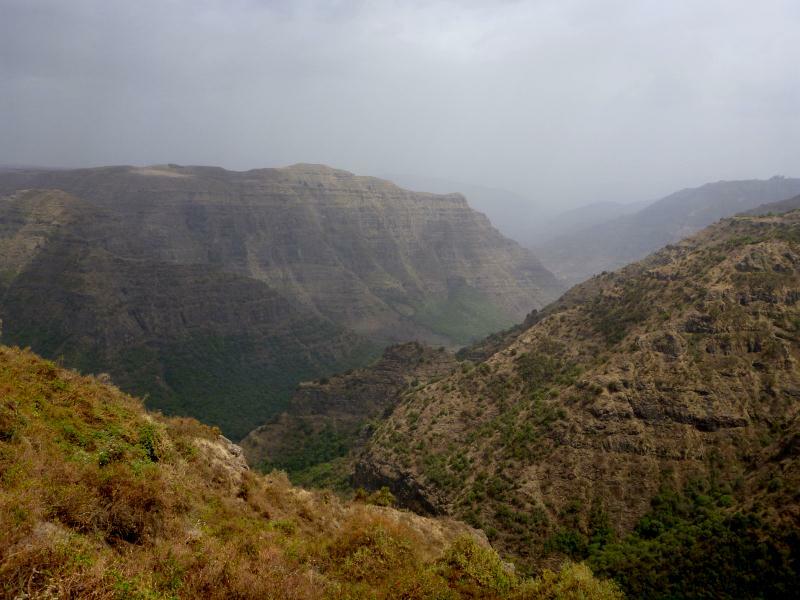 The highlight of the day was to be the Imet Gogo viewpoint and we made good progress. How’s that for dramatic scenery? 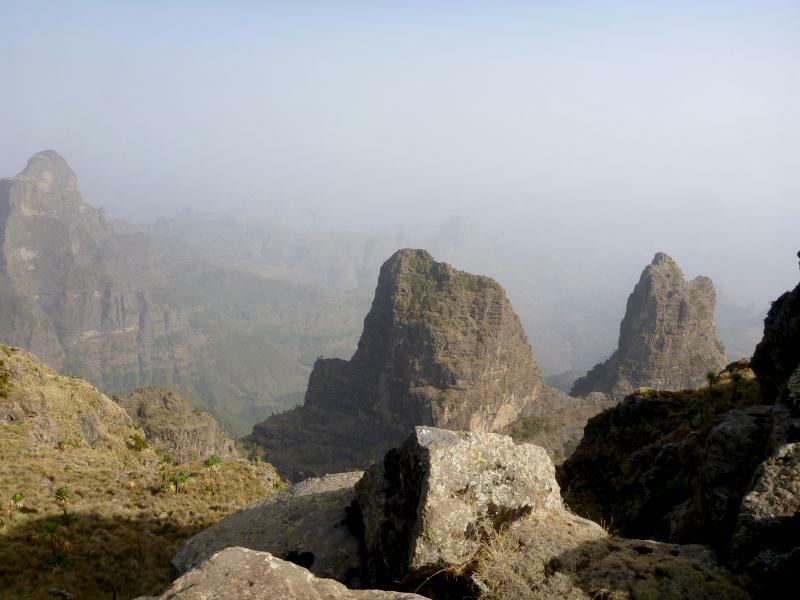 By about 8am we reached the viewpoint and although it was a bit hazy in below, this easily ranks as some of the most stunning terrain I’ve seen in all of Africa. Looking in the other direction yields very different but equally amazing scenery. After an hour or so enjoying the views it was time to head back down the trail, which includes some pretty wild Dr Seuss style landscapes. And back to Sankabar, where I spent the first night. With heading out to the viewpoint and back it made it a longer day distance wise, but it was all downhill so it was not challenging. This time I decided to stay in the lodge and although of course it is very basic it was fine. A short walk away is a spring where they have taps for filling water, and another tap you can use as a shower. The water was freezing and it wasn’t a warm day either, but bathing in spring water in an open shower, in the trees of Ethiopia’s Semien Mountains was enough to make me enjoy it anyways. Like before, my scout followed me and sat a ways away while I bathed which was weird, but oh well, just doing his job! Later in the afternoon two Australians showed up and we had a great time talking, listing to music, playing Uno and cooking our equally pitiful dinners together, haha. 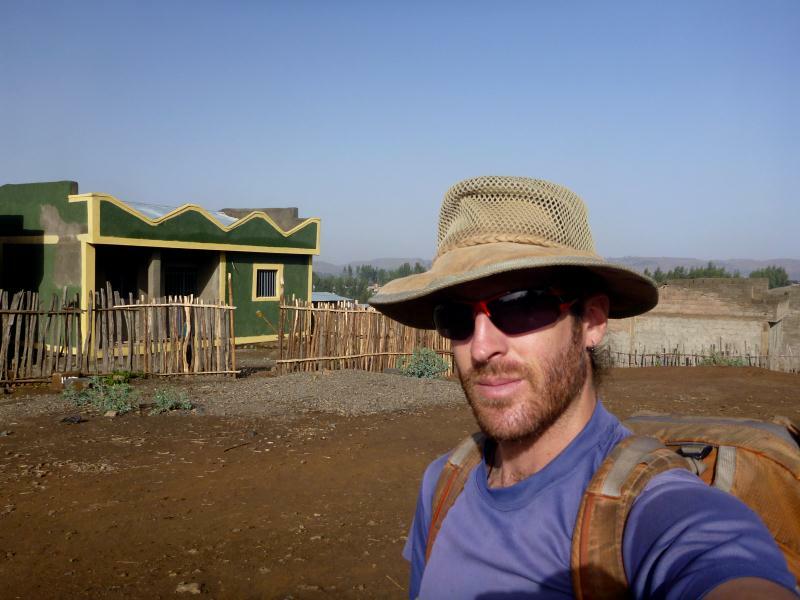 Because I was hoping to get all the way to Addis Ababa via an overnight bus from Gondar, I wanted to hike out as fast as possible the next morning and after loading up the gear my scout and I cranked up the pace a bit and headed off. 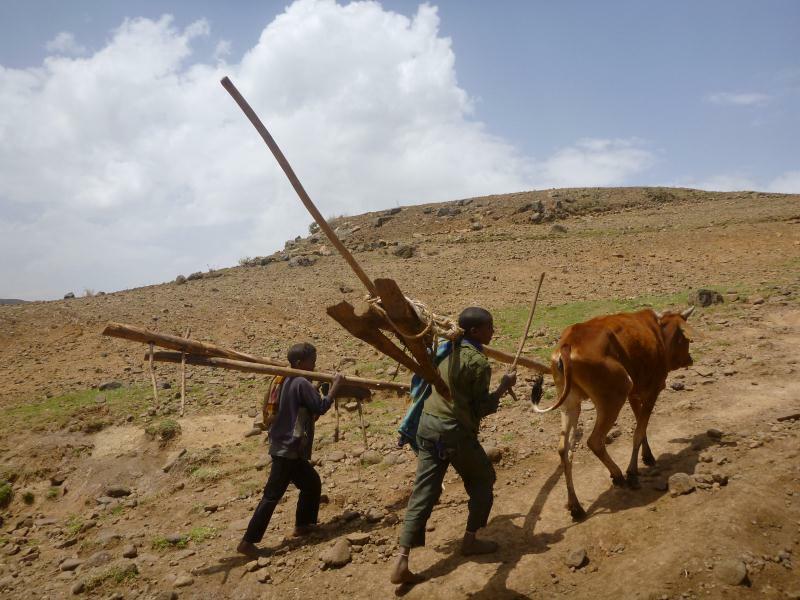 Heading through villages on the way back to Debark. Because the rains were only just beginning again (there had been light rain for an hour or so every afternoon, the start of things to come) the grazing areas were extremely depleted and it looked like all the grass areas had an extremely close shave. With the rain over the past few days, things were starting to green up a bit and it was a very cool transition to witness. 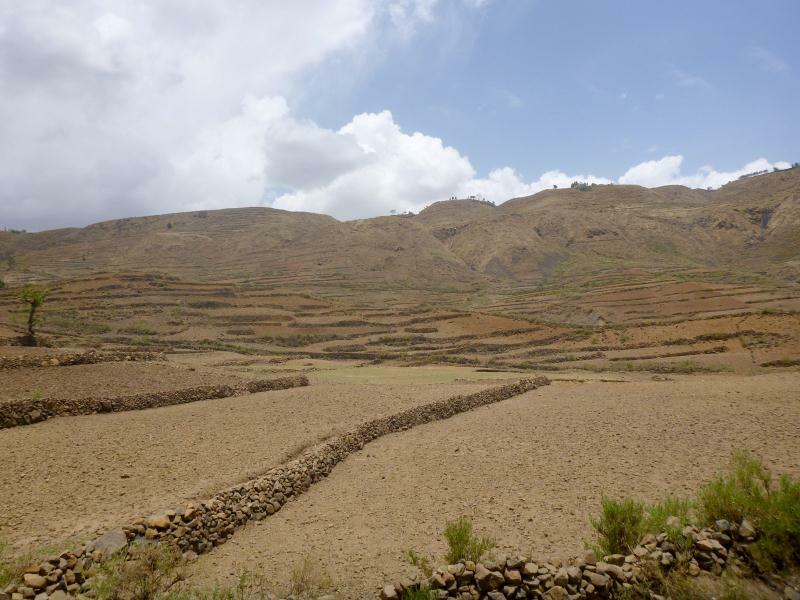 With the coming rains, the men (and boys) were out plowing the fields and planting seeds. Here you can see the very basic tools they use to do the job, but I’ve been plenty of places where they don’t even have plows or animals to pull them, so this was cool to see. 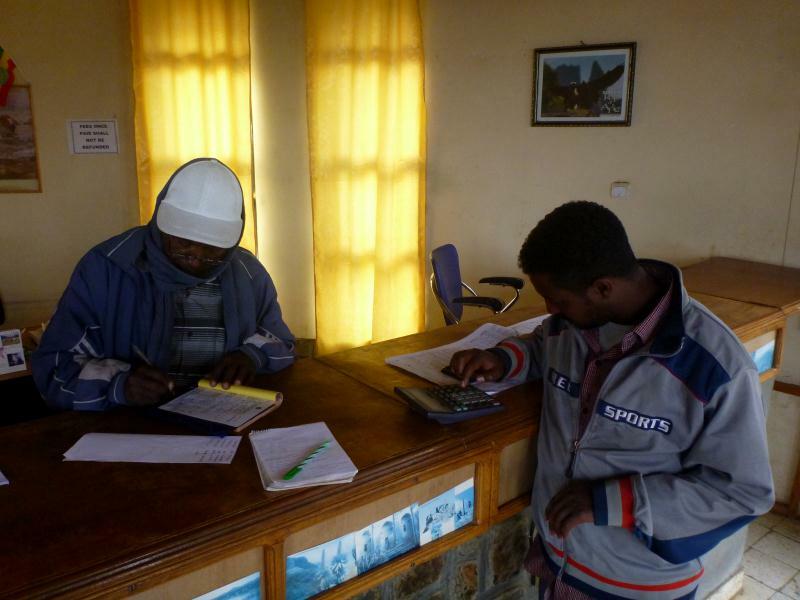 Shortly after noon we arrived back in the town of Debark where we had begun the journey. 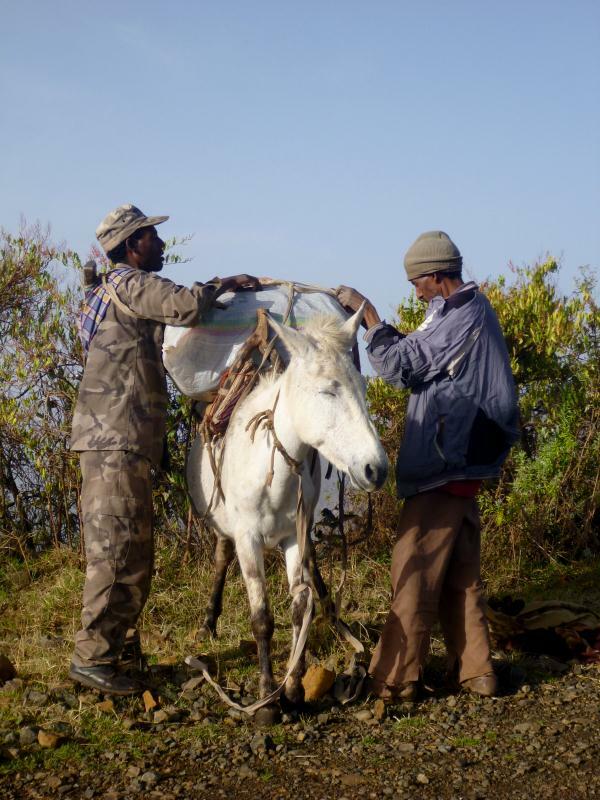 I tipped my scout and mule driver, happy with the job they did, and boarded a bus for 30 birr headed to Gondar. Once again it was a three hour ride, and the woman behind me wouldn’t stop puking, but I made it without problems and without being puked on. 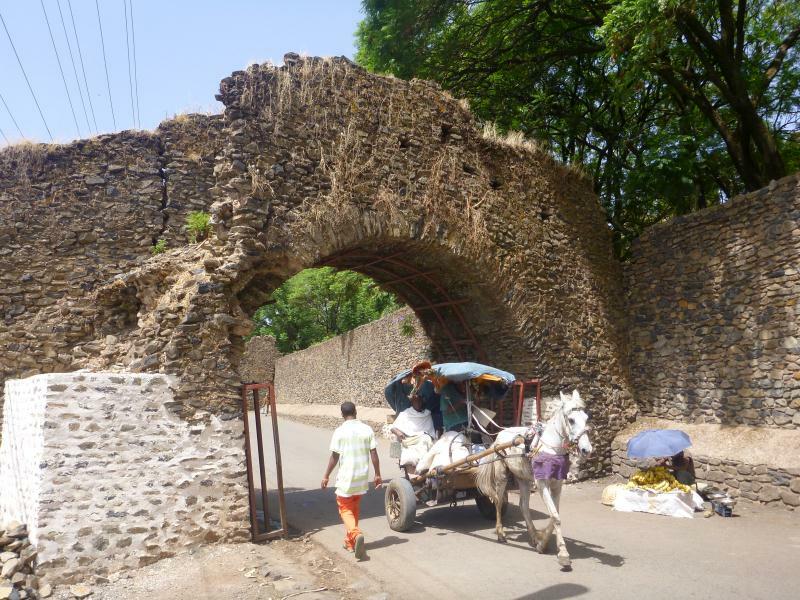 In Gondar I walked around and started asking about a night minibus (which is basically considered the most dangerous form of transport in Africa…) to Addis. Within minutes I found one, leaving in just 20 minutes, and was amazed at how well the timing of this whole journey from Addis Ababa, to Gondar, to Debark, into the Semiens and back was working out! The ride was uneventful. We left just before 5pm, I enjoyed the views of the country side until the sun went down then tried to get some sleep. This didn’t go well, because two times we hit bumps in the road, resulting in smashing my face into the seat in front of me and actually getting a bit bruised and bloodied, but oh well, these things happen. I met some nice local guys on the bus who bought me tea and offered me khat (I’m trying to sleep, no thanks!) 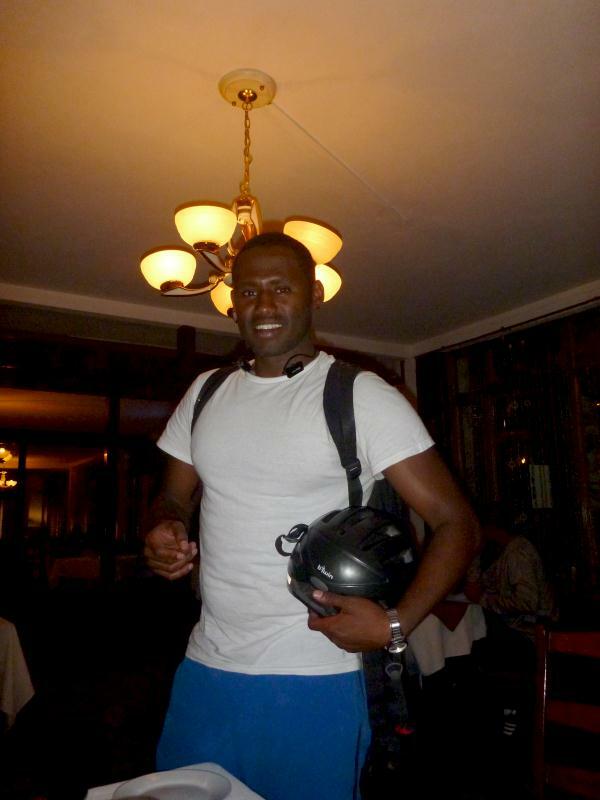 and by about 5am had arrived in Addis Ababa, returning to Addis’ apartment with maybe 90 minutes of poor sleep in me. Again, it was awesome to have such a great host and friend in the city. I spent the afternoon taking a long (cold) shower, washing essentially every piece of clothing I carry with me, sorting photos, using the internet café and drinking coffee. 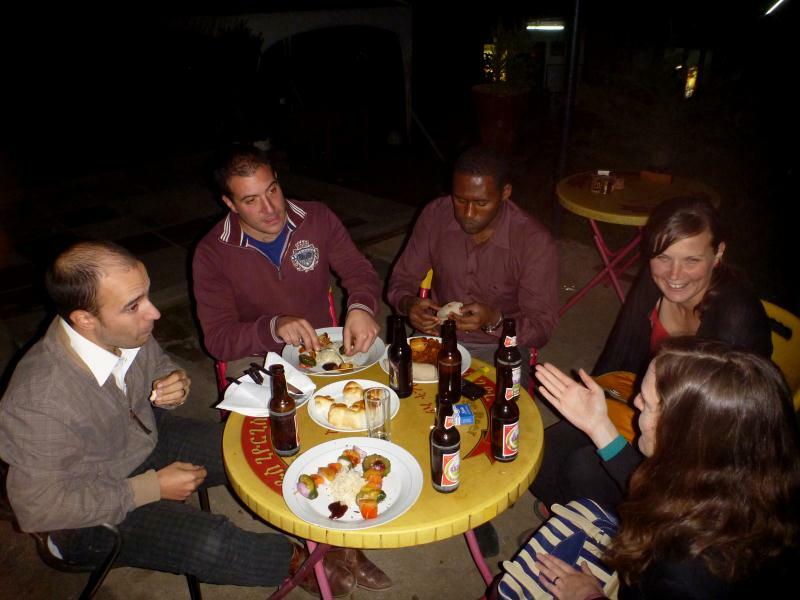 That night I treated Addis to dinner at Taitu to say thanks and enjoyed an evening with him and a random assortment of European expats, travelers, and researchers. 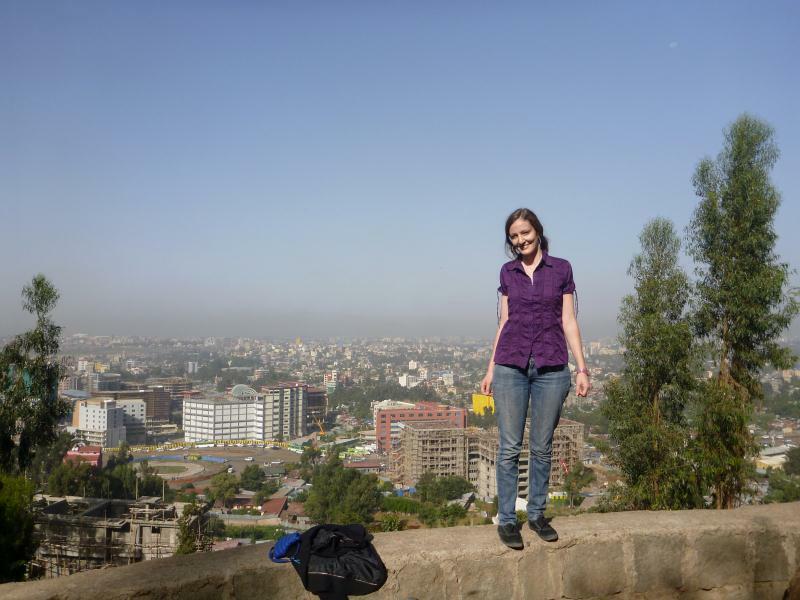 I was leaving Ethiopia in just two days and didn’t feel like doing anything else but getting organized and relaxing. I had a late breakfast with Silke, a friend I’ve made in town who is here from Germany doing research, ran some errands and returned home. 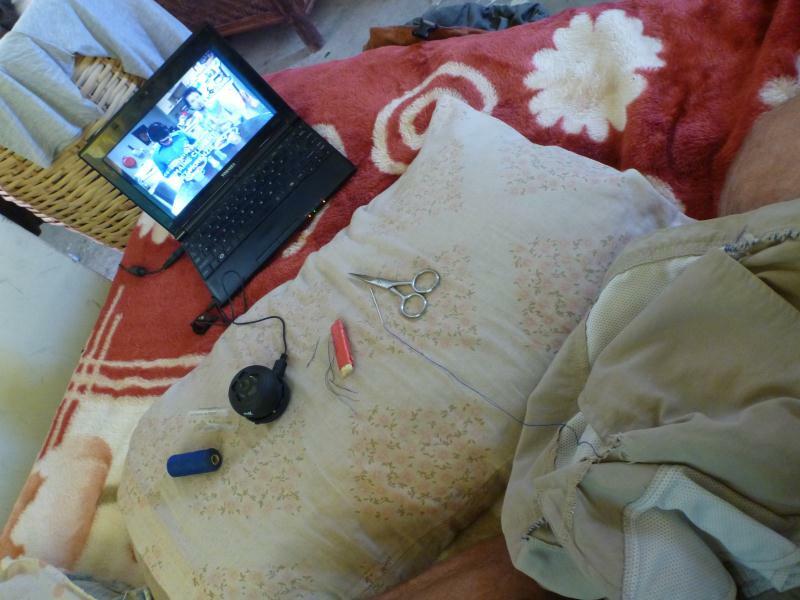 Watching Flight of the Concords and mending my pants, exactly what I’m talking about when I say organization and relaxation. Blue thread on khaki pants? Why not, it’s all I have! These pants have been through something like 24 countries over the past two and a half years, they are well past retirement at this point but with only three more weeks I’m sure they can last until I get home! After another intentionally uneventful and stress-free day the 31st had come, my last day in Ethiopia and time to say goodbye to some of the wonderful people I’ve met here. A bunch of us met headed for dinner at an Indian place, I ate until I was stuffed, thanked Addis for being one of the best CS hosts I’ve ever had and contemplated what was coming next. 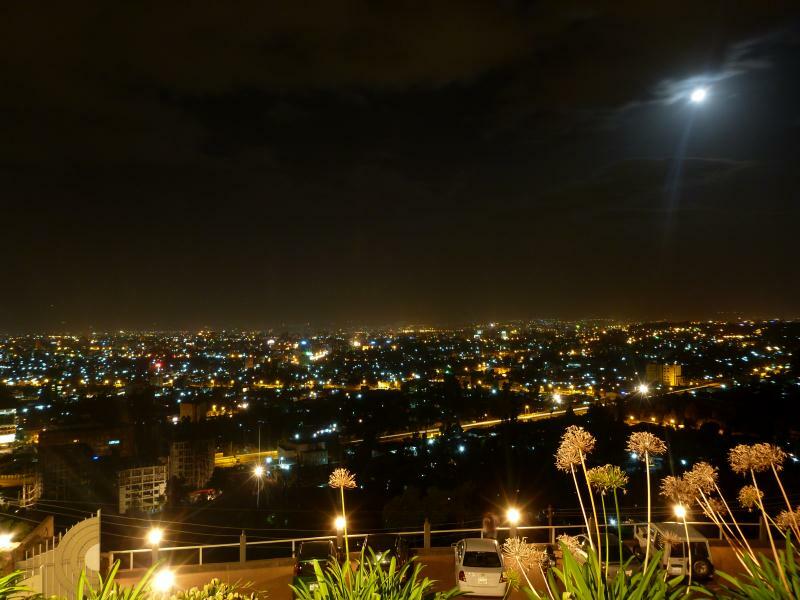 Addis, you are welcome to hang out on my island any time! 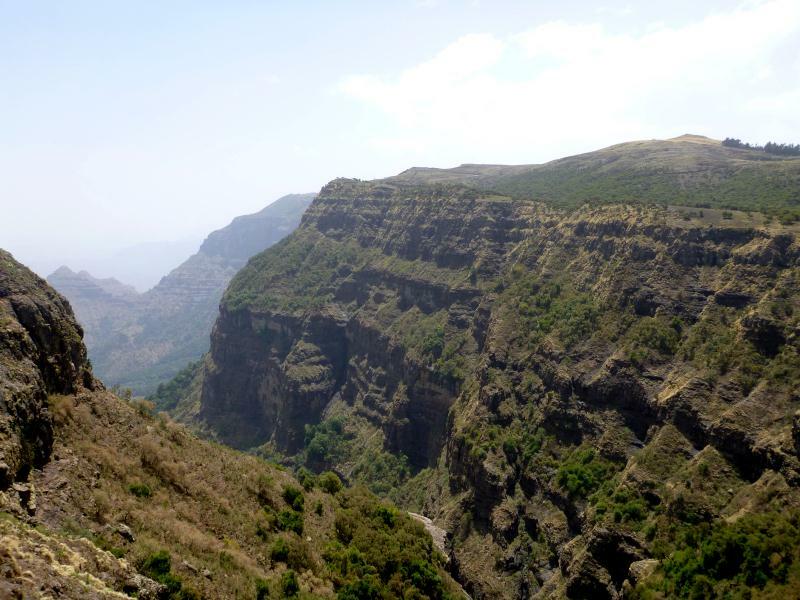 Despite all of its challenges and hassles, many of which I’ve detailed in this and the previous post, Ethiopia is an amazing and wonderful country. I think it is by a wide margin the most interesting country I’ve seen in my travels and this is despite only seeing a small fraction of it. 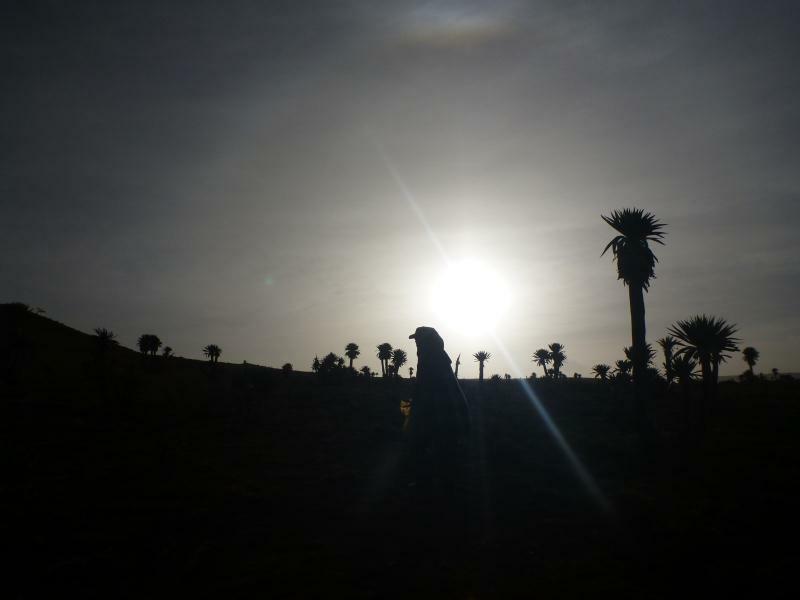 It won’t always be easy, but travel in Ethiopia is an amazing and rewarding experience I would recommend to almost anyone interested in seeing Africa. Egypt has been crazy. I feel like I left Africa behind in Ethiopia and landed in a totally new world, which really I have. I’ve wandered the streets of Cairo (the most insane city I’ve ever seen), visited the great pyramids, taken a train across nearly the entire country, sailed the Nile, seen plenty of ancient Egyptian temples and had some pretty strange encounters on the way. Check back later and you will see what I’m talking about! All content property of Scott Brooks. Travel theme. Powered by Blogger.